The external architecture is stately, the internal fit-out is soaring and monumental. 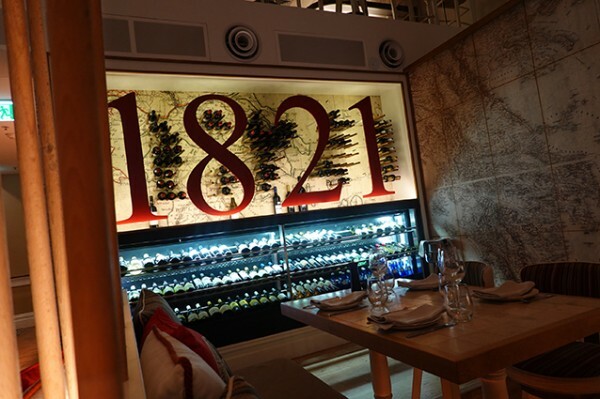 1821 made a big splash when it opened in late 2016 with star modern Greek chef David Tsirekas (ex-Perama) at the helm. 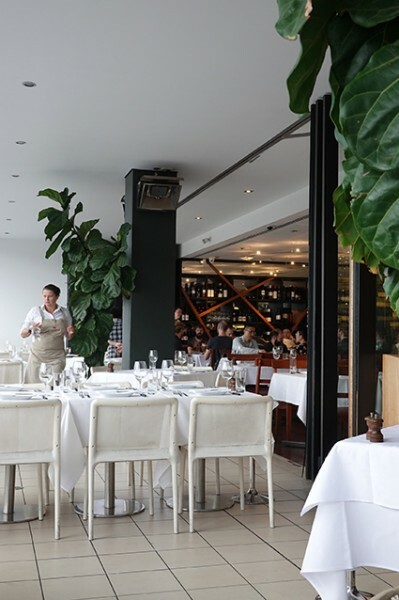 After Tsirekas was poached for some overseas launches last year, restaurateur Jim Kospetas (Universal Hotels) has kept the home fires burning by forging a clever partnership with BlueFish Restaurant Group in Greece. 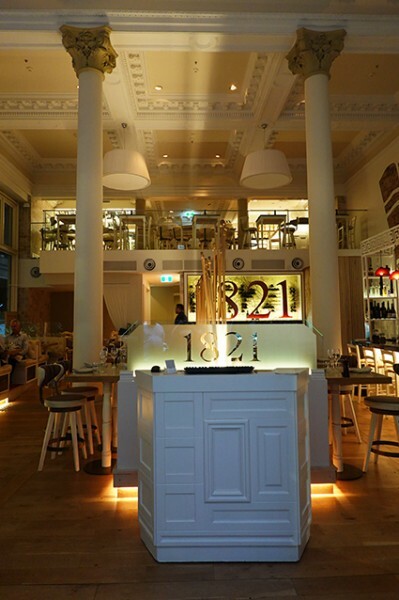 With 1821's menu now overseen by BlueFish’s George Economidis and executed in-house by head chef Luiza Gomes, what you can expect to find are accessible, seafood-focused, contemporary Greek eats. 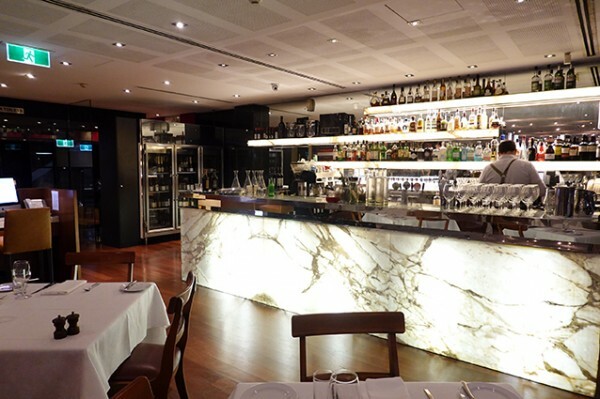 Originally imported from Athens, the multi-million dollar fit-out has seen designer Dimitris Economou return to make a few tweaks, losing the inconvenient island bar and adding a private dining space ringed by white curtains. 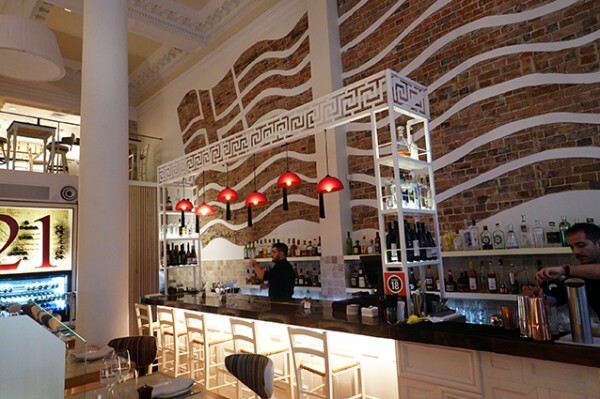 It’s certainly an eye-catching room, with the Greek flag in exposed brick and plaster relief on one wall, ornate columns and equally monumental tiled high tables with cushioned banquettes and soft, pliable stools that swivel for easy accessibility. 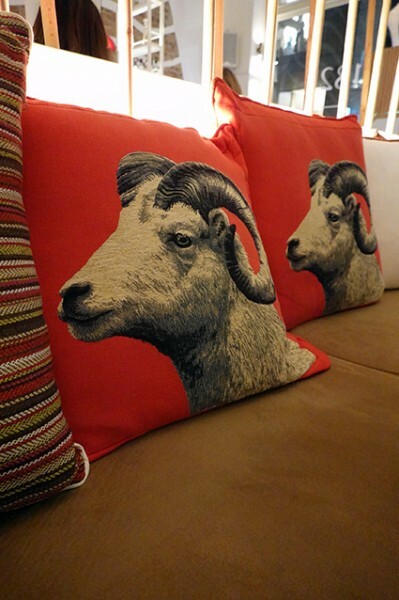 The level of comfort and decent table separation inclines you to relax into the horned goat pillows almost immediately. Sophisticated beverages help too; and Aaron Goodfellow has done a particularly nice job with the cocktail list. 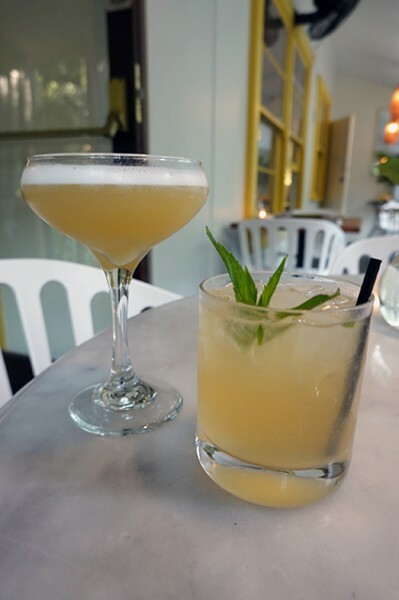 His Achilles Heel ($21) is an absolute cracker with melon-infused vodka, bianco vermouth, St. Germain, pineapple consommé, lemon juice, sesame oil and lemongrass syrup. 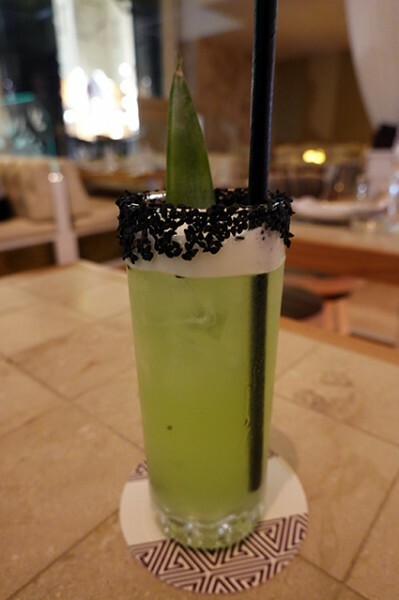 It sounds hectic but it’s so nicely balanced it even made a staunch honeydew melon-hater like me love it before I even tasted the black sesame rim. 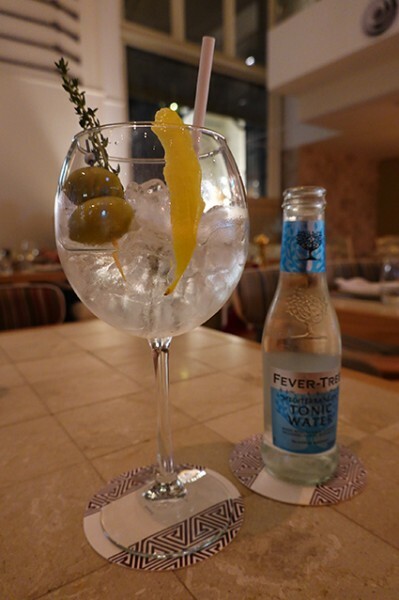 For something less polarising, Tears & Tonic ($21) takes my favourite Gin Mare and teams it with Skinos Mastiha (a Greek liqueur) lemon peel, olives and thyme with Fever Tree Mediterranean tonic passed separately so you can balance your own drink. 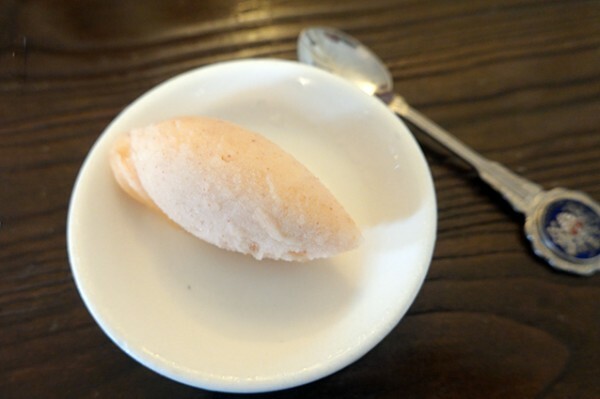 Designed as drinking snacks, the cold mezedes literally fly out of the kitchen. 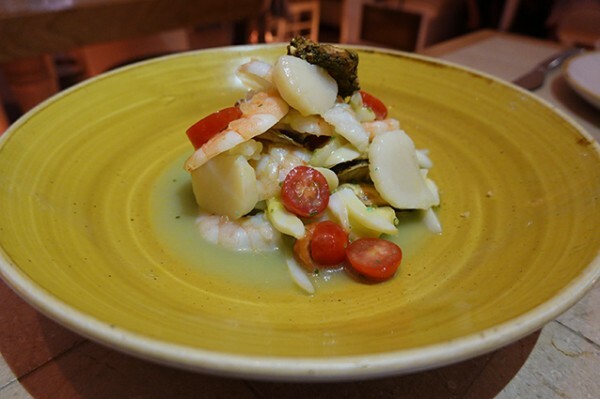 Our appetites are enhanced with a tangy, citrus-dressed Marinato ($28) teaming prawns, scallops, cuttlefish and cherry tomatoes with just the right amount of chilli bite. The Cherry Tomatoes ($18) here could make a Coles shopper weep, with their flavour and balanced acidity. 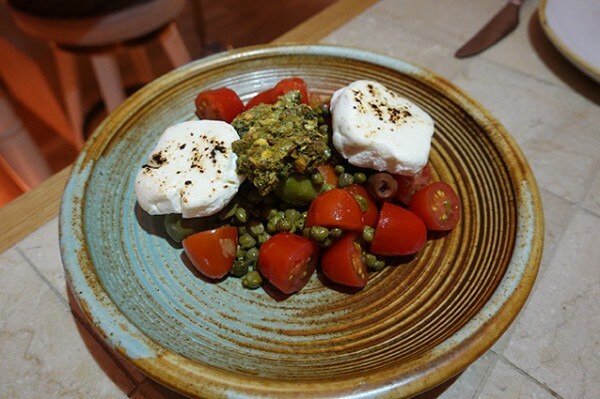 They're teamed with Mizithra, a Greek goat’s cheese, green olives and gentle little capers bound with a tarragon olive oil vinaigrette. Adorned with a pistachio crostini, this simple plate is a standout because of the quality produce. 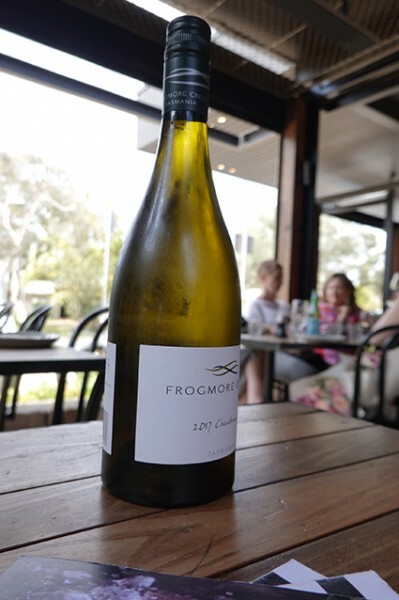 While bread is a bit of a let-down, I’ve got no complaints about wine, especially when served by staff able to make comparisons that guide drinkers towards drinking Greek wines. 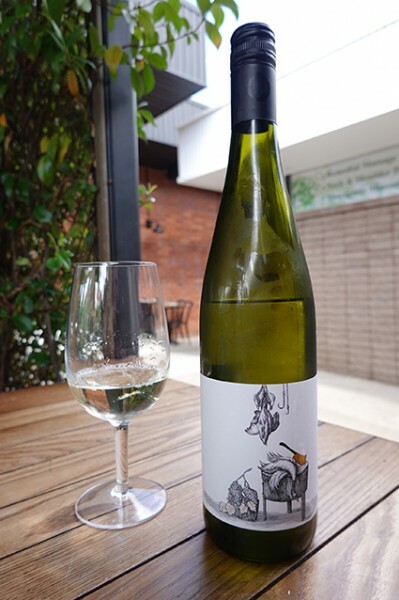 The 2017 Santo Assyrtiko ($17/glass) drinks like a dry Riesling that – along with flowers and citrus – gives you a minerally blast of the sea. The 2017 Domaine Zafeirakis Estate Chardonnay ($19/glass) started a bit tight, linear and lemony but came up peaches with our pasta dish. 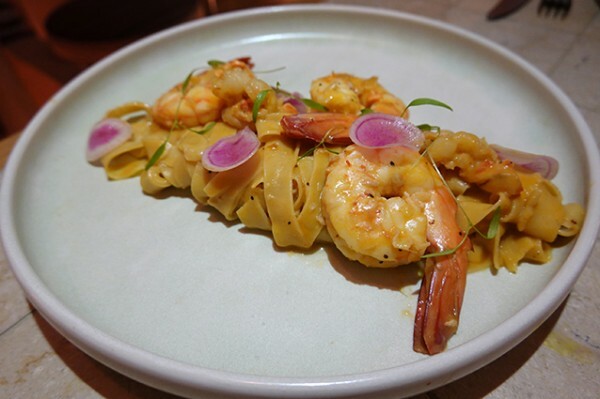 Dubbed Cacio E Pepe Di Mare ($36) this well-presented column of Greek egg noodles (hilopites) is dotted with large, creamy prawns and crayfish pieces united by sea squirt butter that instantly summons summer memories of rockpool diving. I’m not crash hot on the Mussels ($28). 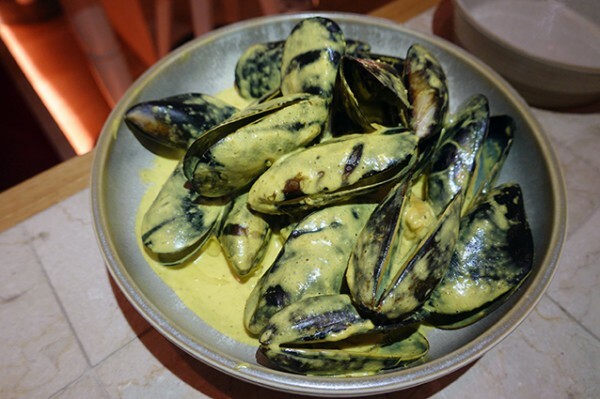 While the plump bivalves themselves are beautifully cooked – as they are in most Greek restaurants – the secret curry mix hasn’t quite been cooked into the coconut milk for long enough, leaving a bitter, floury mouthfeel that, even gussied up with lime and coriander oil, is hard to enjoy. 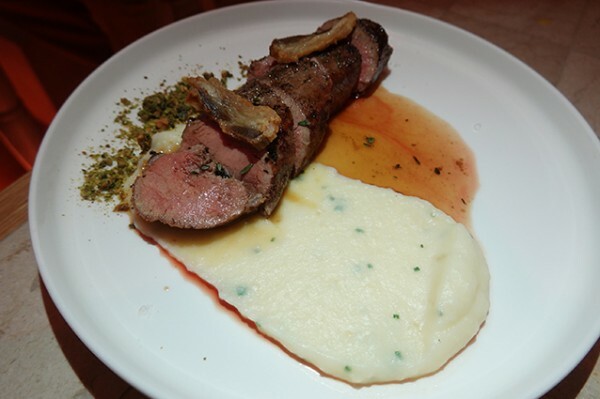 Lamb ($33) – another mainstay of Greek restaurants – is presented Souvla style (cooked over charcoal). The pink-centred meat is beautiful and tender with a salty ring of crackled skin, moderated by potato purée and a very mild demi-glace. 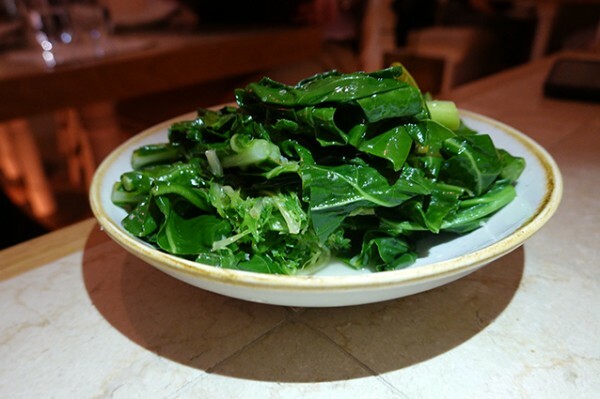 All it needs are some greens – Horta ($7) – a generously proportioned bowl of cooked bitter greens teamed with lemon juice, flake salt and olive oil. You can literally feel the iron working on your body as you wash them down with red wine – a brooding 2017 Lost Turtle Pinot Noir ($18/glass) that actually turns out to be heavier in weight than the Nebbiolo-style Greek red: 2017 Thymiopoulos Estate ‘Young Vines’ Xinomavro ($17/glass) I avoided ordering. With the lamb less hefty than the usual Greek shoulder, if you don’t order a main to yourself, you’re likely to want dessert. 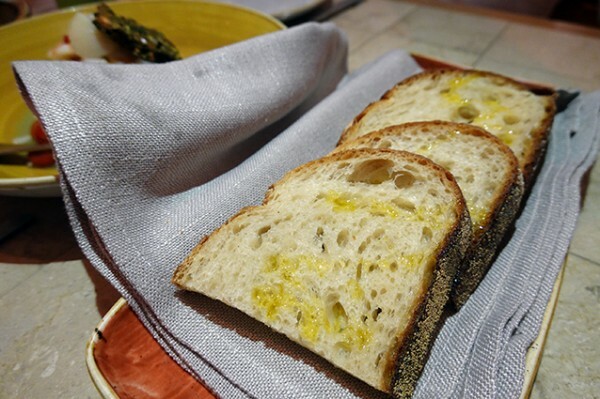 Presented like Italian cannoli, the Galaktoboureko ($17) here is your must-eat. 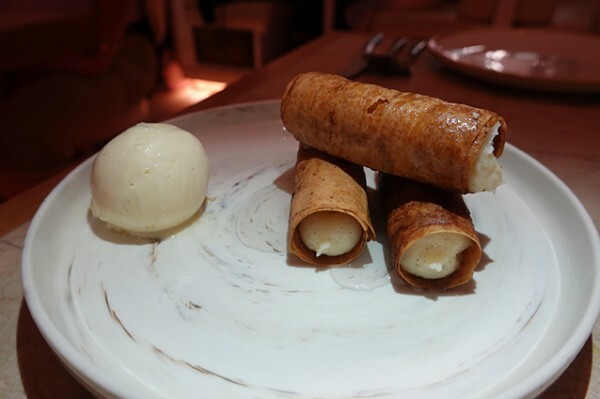 While modern in appearance, this traditional dessert update hits the sweet spot with all the same elements: filo pastry, custard, cinnamon and positively silky vanilla ice cream. 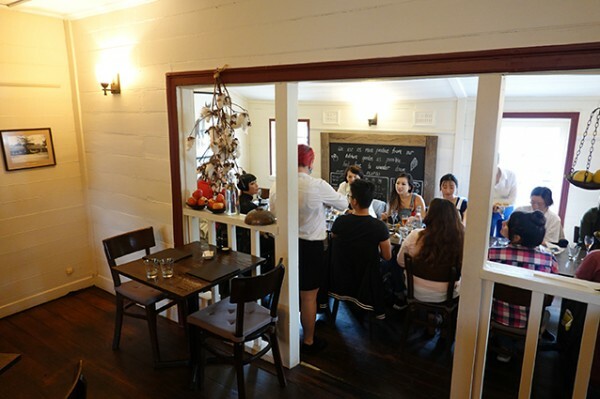 While Campsie doesn’t have the late-night dining options of suburban hot spots like Burwood, if you visit a little earlier in the evening, you'll still find a vibrant food scene. 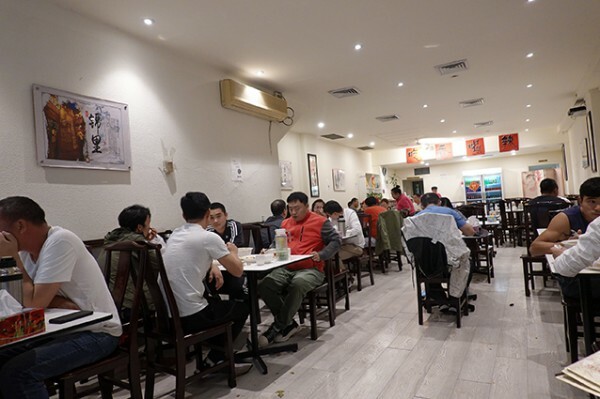 Located on Beamish Street, Campsie's main drag, Sichuan Impression is a bright, white space with orderly rows of white tables surrounded by high-backed dark wood chairs. They’re nearly all filled by men, chatting animatedly with each other, rising to toast each other’s good fortune with booze they've brought in. 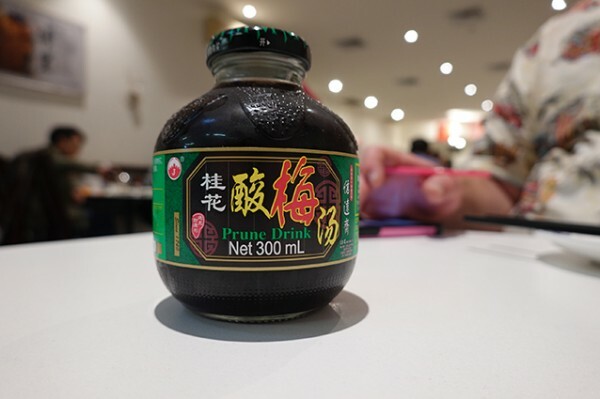 Not being smart enough to bring wine, we’re drinking Chinese Hot Tea ($2) that suits the chilly weather, and a smoky Prune Drink ($3) that - over the course of my last few Chinese reviews - has begun to grow on me. 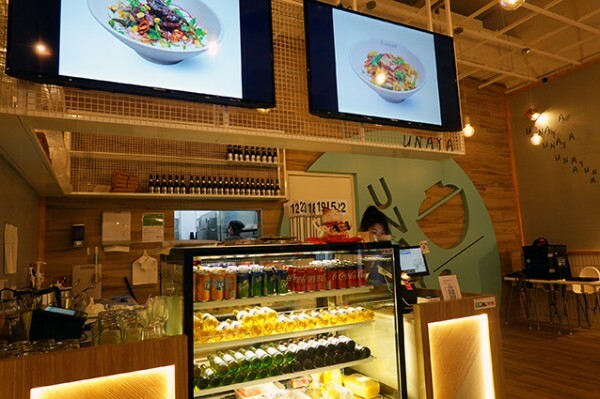 Illustrated by photos, the menu is in both Chinese and English, making it easy to select your dishes. 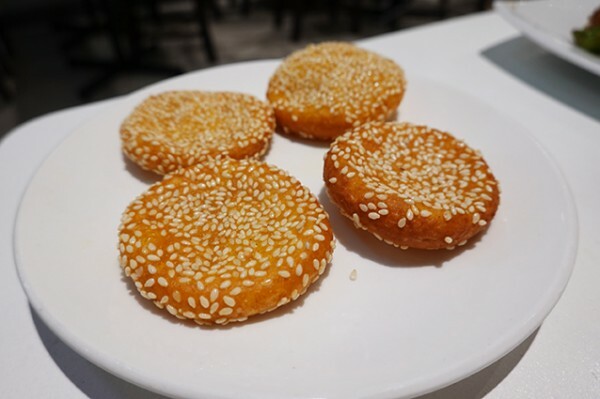 We start with four puffy Mushed Sweet Pumpkin Cakes ($6.80/4) with their nutty sesame seed-dotted exteriors balancing their sweet pumpkin interiors rather nicely. 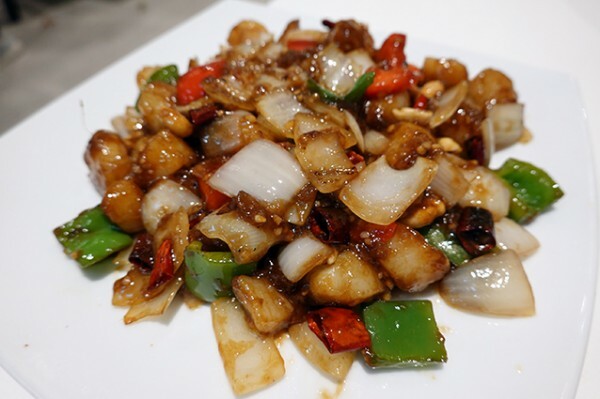 Eaten in isolation, Kung Pao Scallops ($22.80) strike me as a bit sweet, but the dish grows on me with tiny well-cooked scallops, crisp red and green capsicum, chillis, peanuts and sweet curls of white onion. Taken in combination with a much more savoury wok full of Dry Fry Potatoes ($16.80) the scallops help make create a meal that strokes all of your palate. The even better potato dish contains thinly sliced spuds fried off in sesame oil with a splash of soy, Sichuan peppercorns, ginger, garlic and chilli. 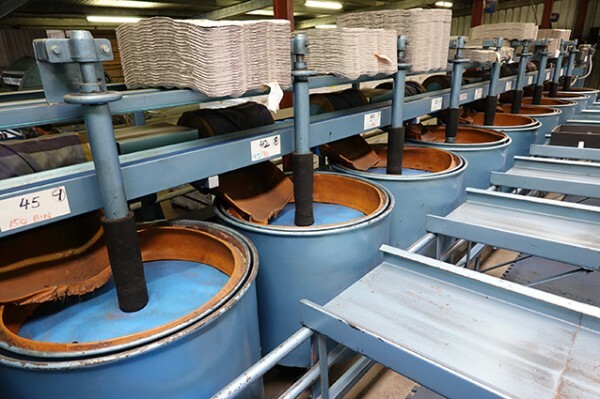 Each sliver of potato is perfectly cooked - some are crunchy and full of flavour, because most of the starch has been rinsed away. 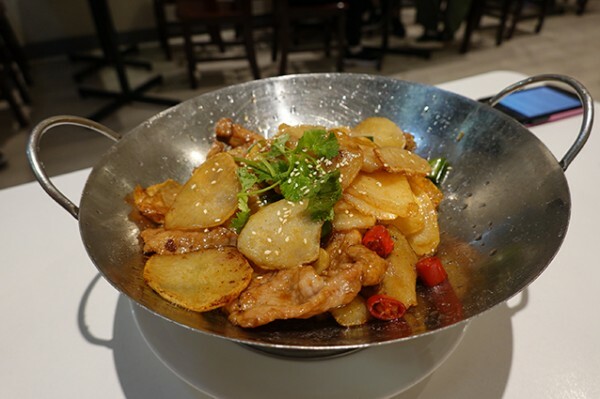 The mandolined potatoes are broken up with flavoursome red chilli and a small amount of thin pork slices. I find it hard to keep my chopsticks away from this dish. 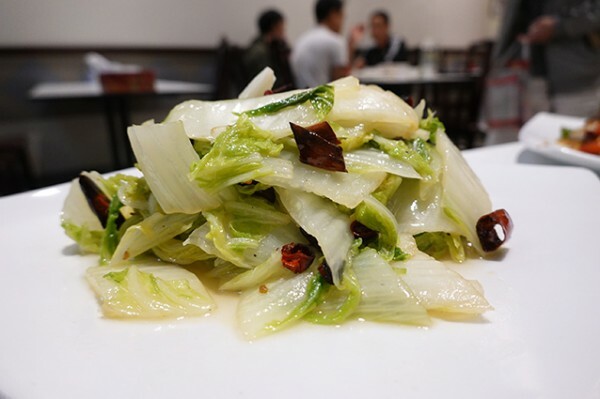 To round out the meal with some greens, we hit up Stir Fried Chinese Cabbage ($13.80) with dried chilli. It’s savoury and compelling without being too hot. Once again, by itself this dish is nothing too flash, but eaten in combination with our other dishes, it adds up to a great meal for two people that was priced fewer than seventy bucks. 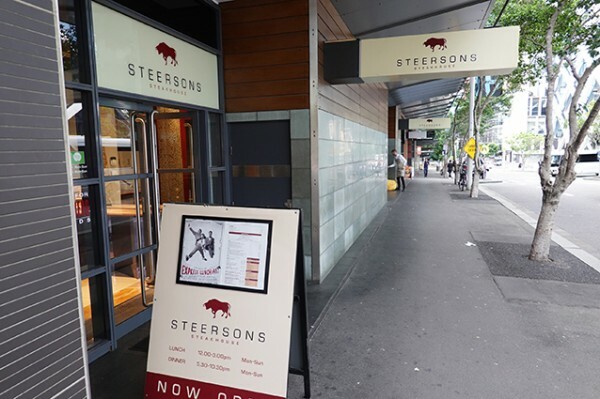 All this got me thinking that it was a good time to get reacquainted with this waterfront ‘hood, starting with a meat fix at Steersons Steakhouse. 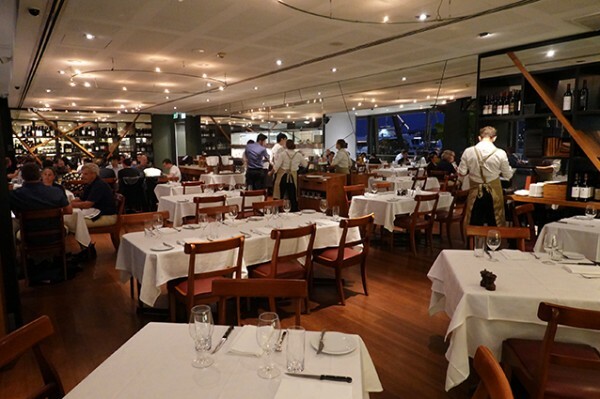 Beginning its King Street Wharf journey as Kinglseys Steakhouse, Steersons has been around since 2004. 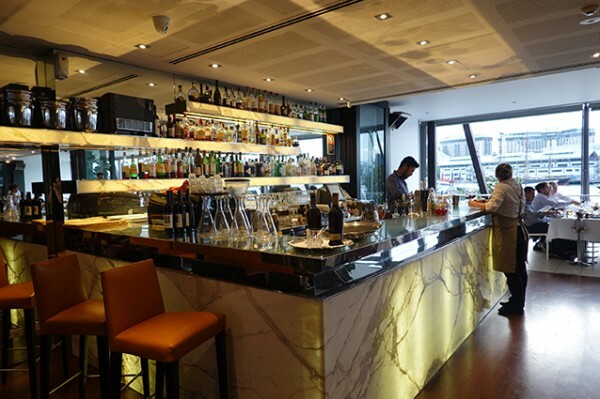 Still centred upon the waterfront view, the dining room has aged quite nicely, with a backlit marble bar providing a focal point inside the light and airy space. 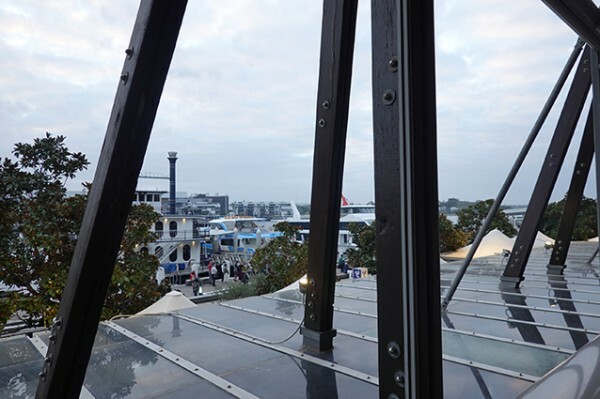 Despite the suddenly inclement Sydney weather, we decide to pull up on the wide airy balcony. 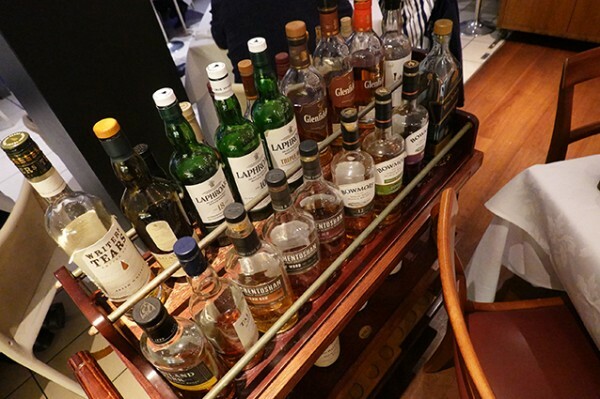 With a well-stocked whisky trolley capturing my attention on the way to the table, I’m keen to kick off with a whisky cocktail. Their interesting, one-page list gives me two to choose from. 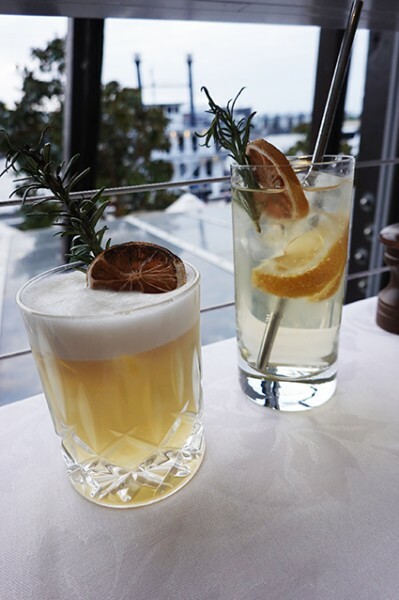 ‘Fiddich’n’Co ($19) proves my favourite with its easy-to-drink blend of Glenfiddich 12-years, PS40 smoked lemonade and charred rosemary, though the Wood Smoked Whisky Sour ($20) made on Monkey Shoulder Scotch whisky was tart and enjoyable. 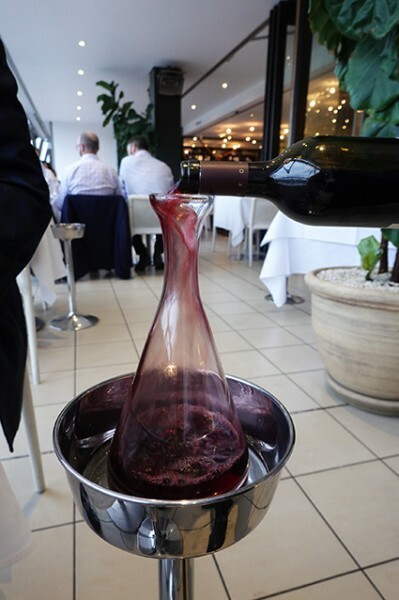 Wine is actually the restaurant’s main game, with red wine being their strong suit. 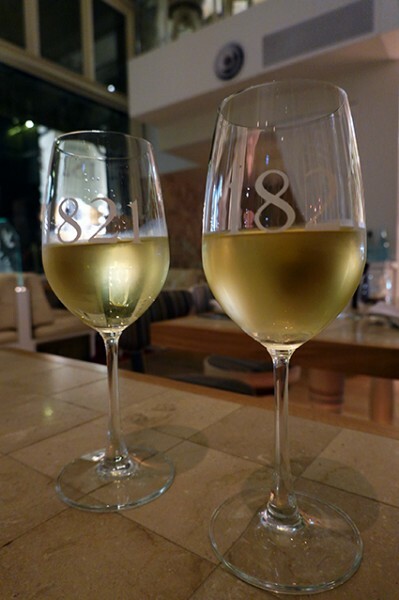 The wine list gives you plenty to choose from, with a good selection of entry-level wines around the sixty-buck mark. 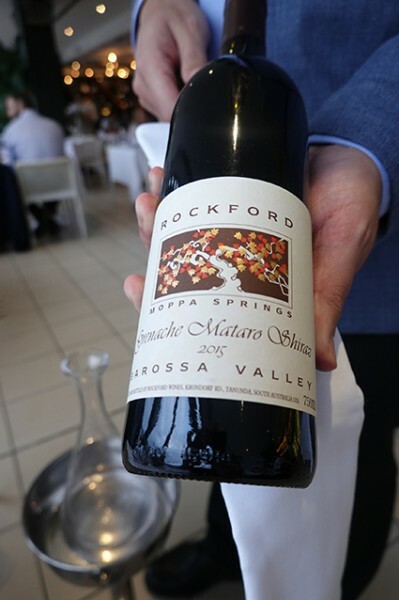 Being a light-weight red drinker, I hit up the Grenache selection for the 2015 Rockford Moppa Springs ($99/bottle) that is decanted at the table. 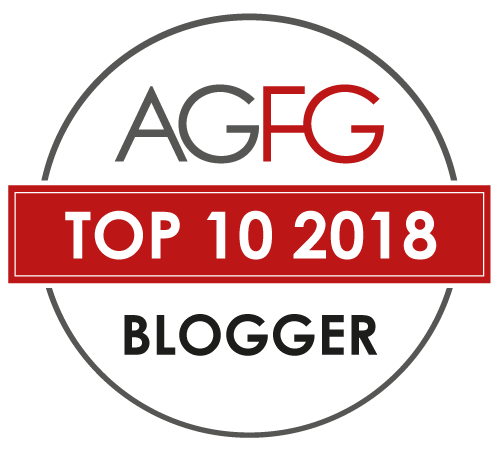 It’s a smooth, savoury (almost salty) blend of Grenache, Mataró and Shiraz with lots of red fruit and enough acidity to cut through the richness of steak. If you’d like to engage in a bit of foreplay before you meet your meat, there are Oysters ($25.90/6). 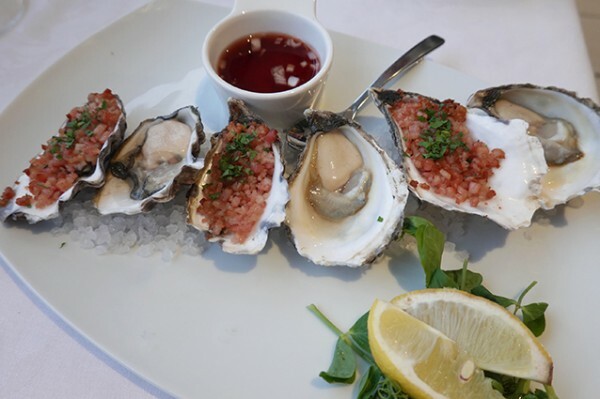 On the evening I dined, the bivalves were sourced from Wallis Lake, and scrubbed up better as Kilpatrick than au natural, because there wasn’t much natural liquor to be had. There’s also a short list of entrees, from which the Albacore Tartare ($21.90) jumps out. 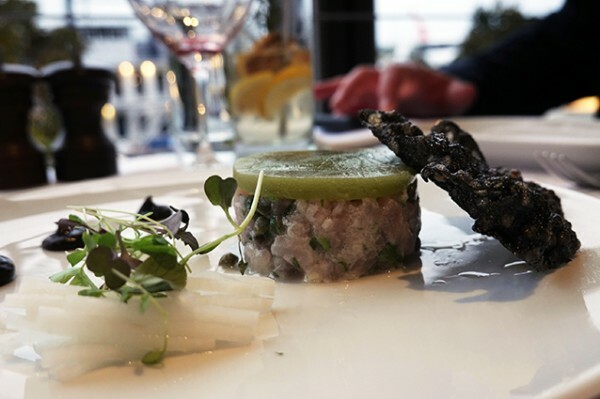 A raised disc of tuna tartare is given more height with a pale green cucumber hat. 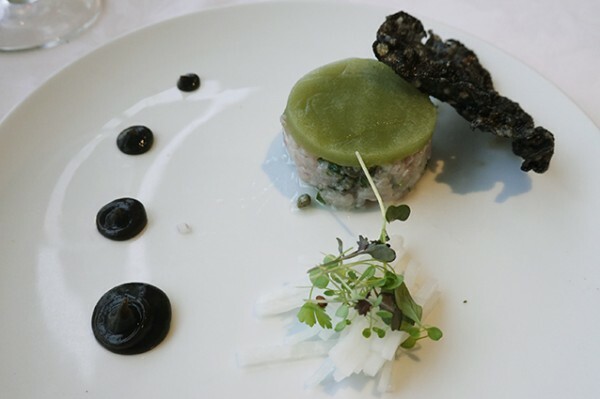 The nicely presented plate is balanced by dots of briny nori gel and a daikon salad. Scooped up onto a squid ink cracker, it’s enough to whet the appetite without cutting into vital real estate. Because – let’s face it – like most of the weeknight blue collared shirt brigade – you’re here to eat beef. In the kitchen it will be charred on a 400-degree Celcius grill, then finished in a combi oven to your liking, before being rested for half of its cooking time. 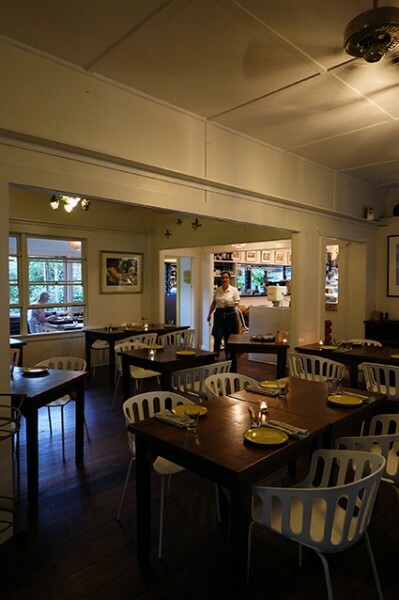 The menu cleverly explains all the parameters, from provenance to cut to cooking level, to help ensure everyone’s happy. 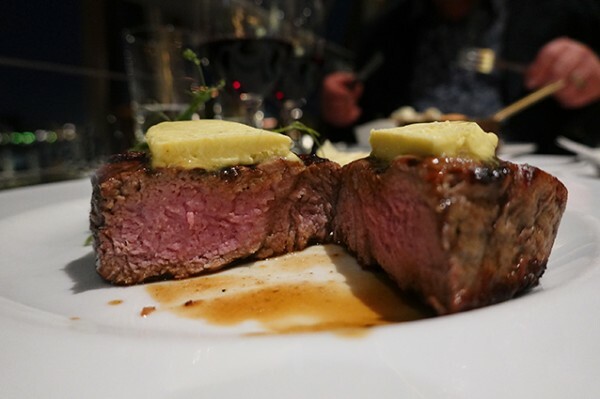 It’s a clever way to handle larger corporate groups, where the wait staff might not get to speak directly to each diner, to explain the lower central temperature of a steak cooked to rare or blue. 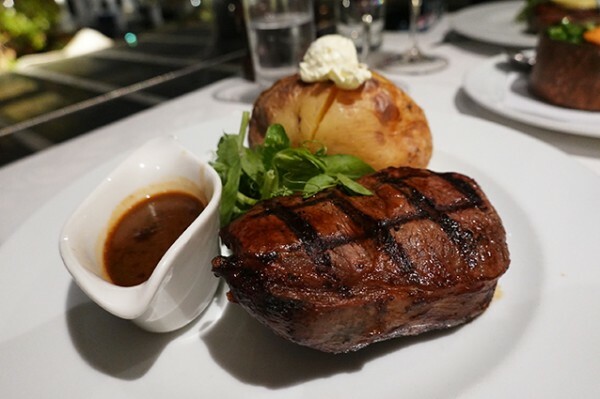 I’m pleased to see more grass-fed options have appeared on the menu since my last visit, and choose a conservatively-sized 200-gram Riverina Pasture Fed Eye Fillet ($44.90) cooked to medium rare, with mash and an indulgent disc of Blue Cheese Butter ($3). As per the menu promise, the centre is very pink against a charred exterior. It’s super tender, enjoyable-to-eat meat that doesn’t overwhelm me with its size. My dining companion looks to Grasslands pasture-fed, hormone and antibiotic-free beef for his 300-gram Rib-Eye ($42.90), teaming it with a slightly less exciting baked potato and a gravy boat of Green Peppercorn Sauce ($4). 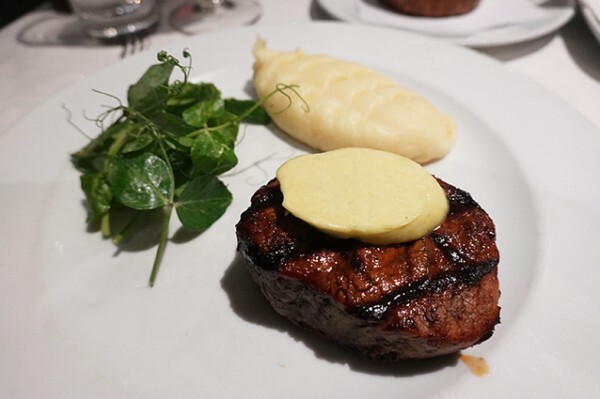 It’s got more texture and bite, but I’m not gaga over the flavour, preferring my eye fillet, though it does go better with their mustards. 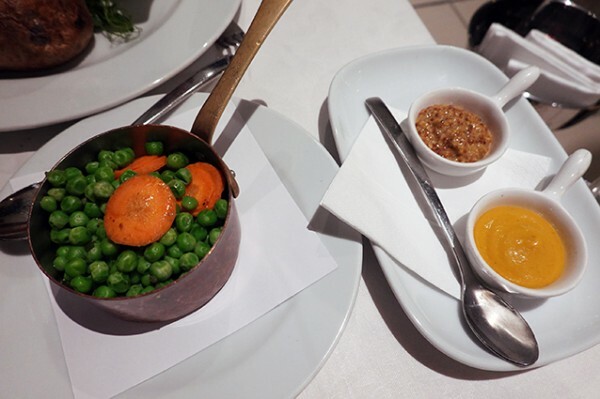 With just a tangle of pea shoots on each plate, the steaks here are predicated on ordering a side. 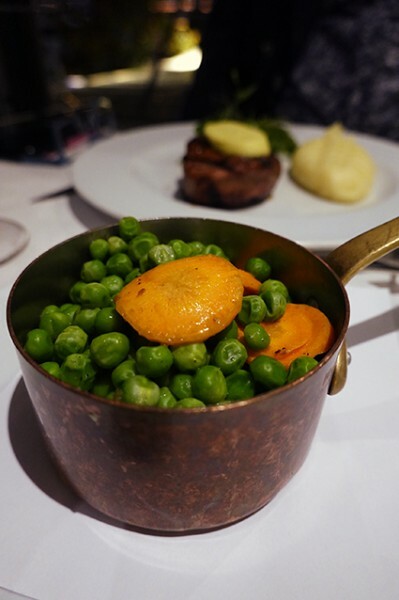 Peas, Pickled Carrots and Honey Star Anise Butter ($10.90) gives a modern tweak to my peas, mash, carrots and meat memories of yesteryear. The kitchen’s performance - and the more moderately sized steaks - incline me to dabble in dessert. 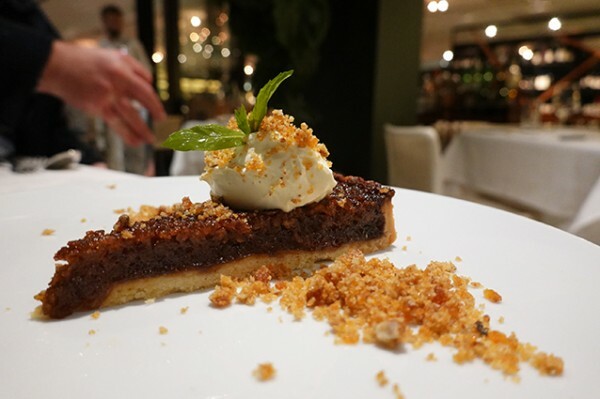 The Treacle Tart ($14.90) makes me super-glad I did. It’s a very adult dessert, with treacle well-balanced by tart sour cream, textbook pastry and salty pecan praline. It’d be the ideal dessert to accompany a late-night whisky cart visit to your table, before you roll forth merrily into the night. 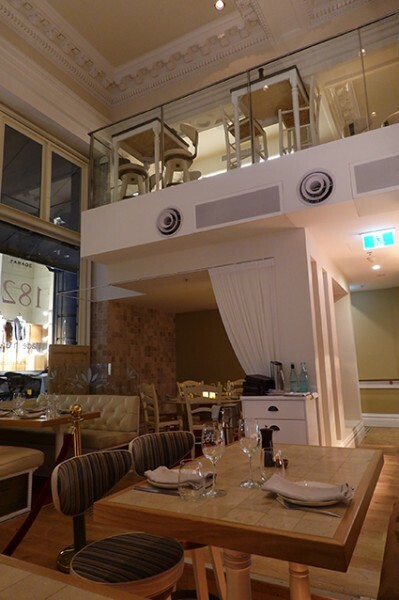 Steersons Steakhouse is a King Street Wharf stalwart for a solid and dependable reason. 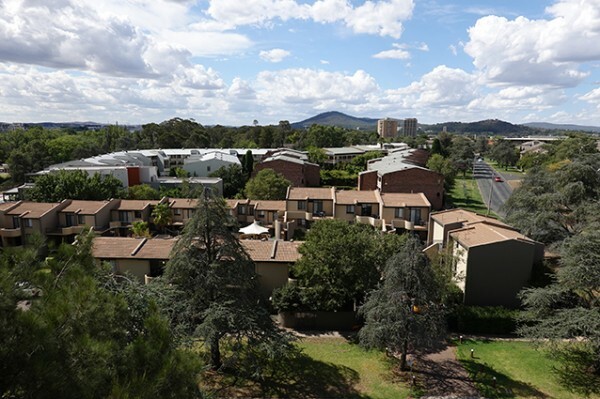 Canberra is arranged in distinct suburbs, each serviced by their set of own restaurants and stores. 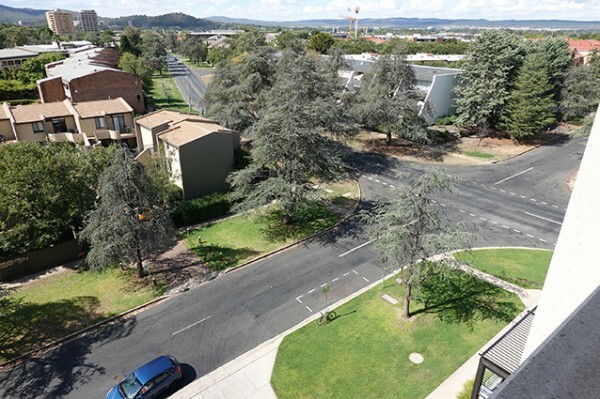 For Deakin, which sits inside the Parliamentary triangle at the gateway to five prominent Canberra suburbs, it’s a local shopping centre on Hopetoun Circuit. 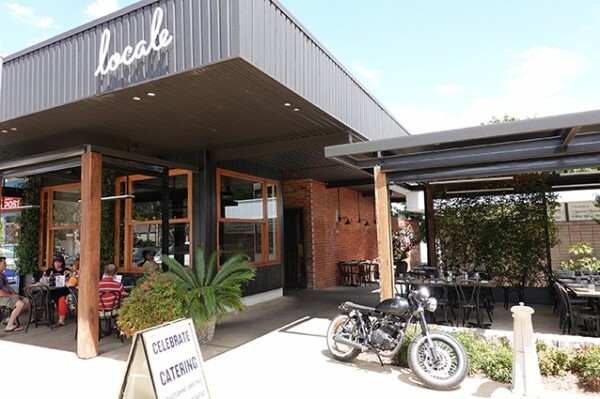 This suburban strip mall boasts a pharmacy, a bottle shop, an IGA supermarket, a café and Locale Pizzeria. With the days of al fresco dining drawing to their seasonal finish, we took advantage of the warm weather and pulled up in their outdoor cabana. 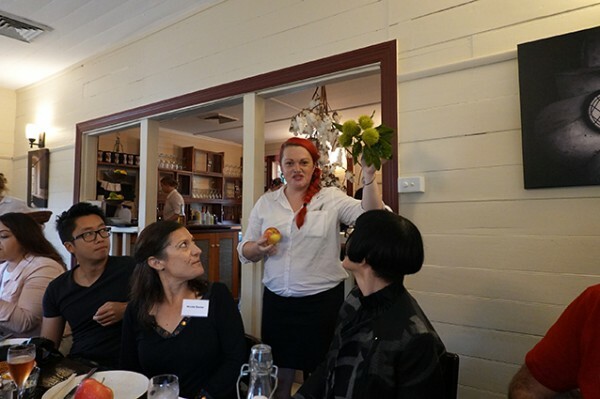 With a voice that instantly took me back to Play School, Noni Hazlehurst is holding court at the next table, with a gaggle of gal-pals. 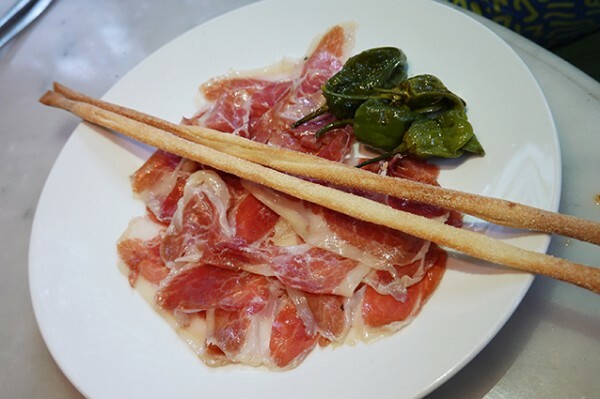 It’s the kind of menu that lends itself to a long girly catch-up with easy-to-share antipasti and pizza, backed by decent, well-priced wine. 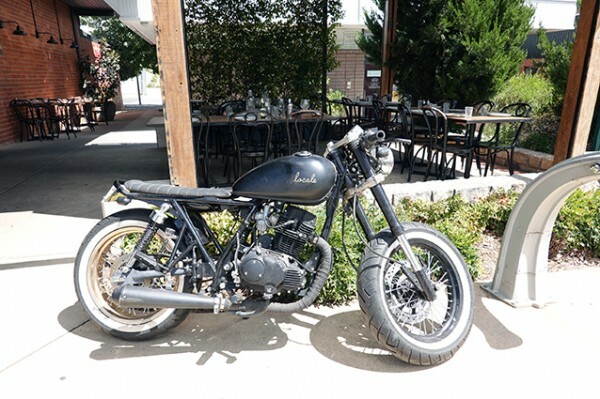 And, with an outdoor spritz bar in the works, Locale is only going to get better. 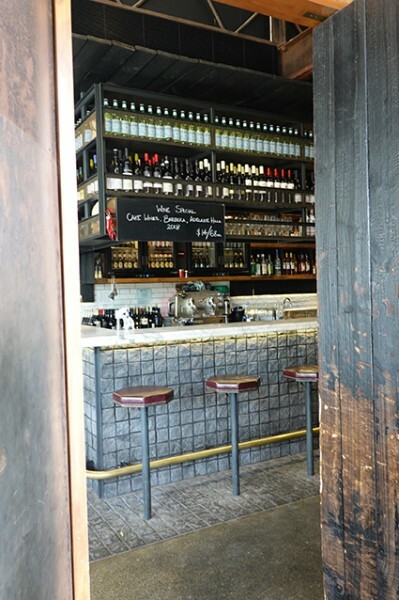 With most wines available by the glass, and a focus on Italian - both imported and Italian varietals we grow here - plus a nod to their location in the Canberra region, there’s already plenty to get excited about. 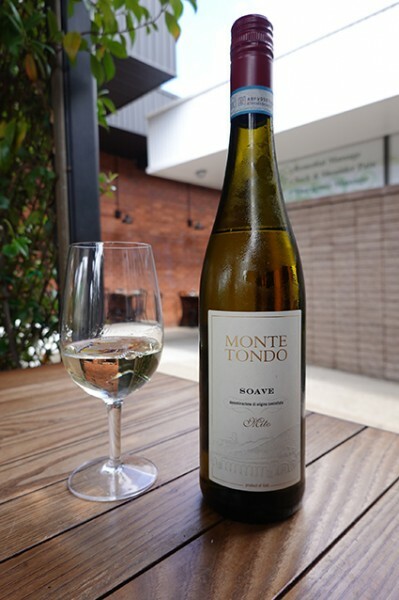 We start with a foot in each camp – an easy-drinking Italian Monte Tondo ‘Mito’ Soave ($9.50/glass) and a local guy, the pretty, citrussy Ravensworth Riesling ($11/glass). 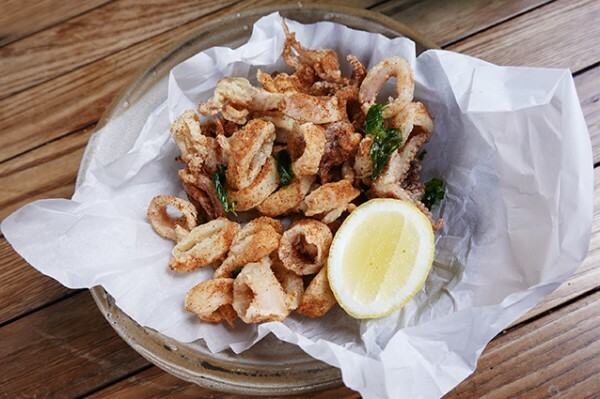 Both go gangbusters with seafood, and the Calamari Fritti ($18) here is fantastic. Seasoned with their own intriguing salt’n’pepper spice blend, it’s oil-free and super tender – arguably the best version of this dish I’ve tried. Fiori Di Zucchine ($19) are another thing Locale get exactly right. 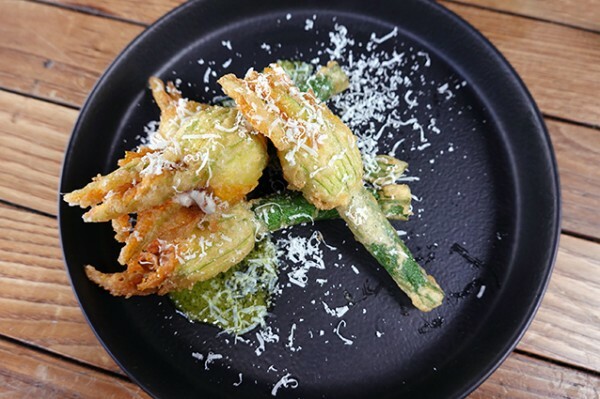 Battered so ephemerally their colours shine through, the still-crisp zucchini flowers explode on the palate with a generous amount of creamy goat’s cheese. 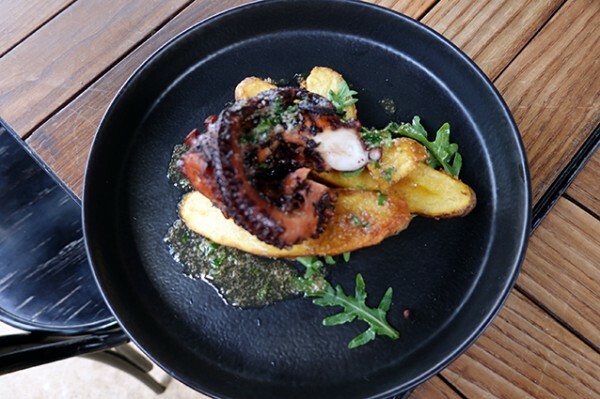 While Slow Braised Fremantle Octopus ($24) with kipfler potatoes and lemon butter is handled well and kept simple to highlight the quality produce, the maddening smell of baking dough and Australian garlic kept reminding me to save some room for pizza. Clutching an off-road powered skateboard – an anniversary present from his wife – charismatic owner Omar Muscat, pops by my table and gives me the lowdown on his pizzas. 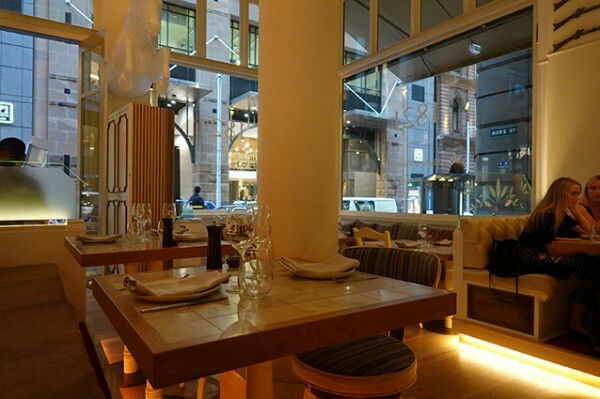 The son of two pastry chefs, Muscat is an experienced restaurateur. 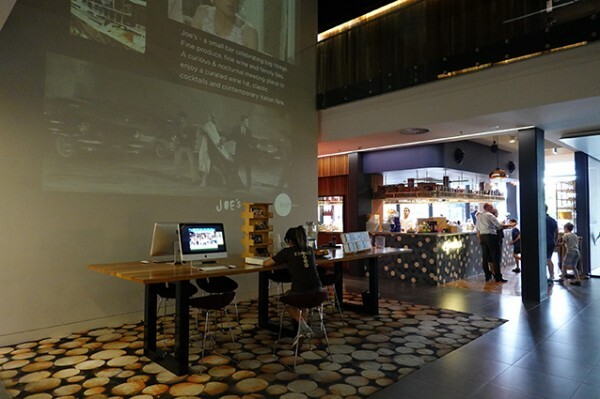 His hospitality journey began at age sixteen, and his first venue – a sandwich shop in Woden Plaza - came at the tender age of twenty-two. 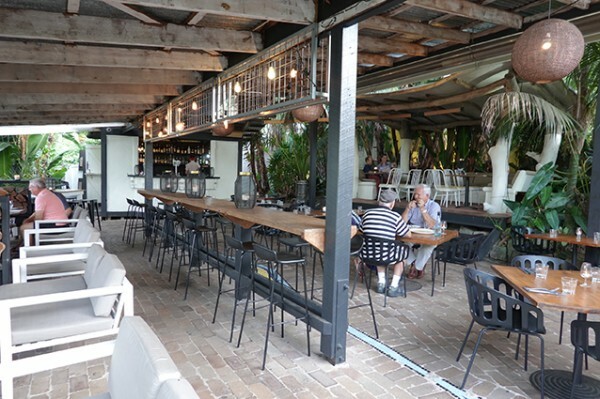 While at its peak, his stable of venues - held with former business partner Michael Nagy - numbered twelve and included Double Shot café next door, Muscat has pared back to focus on life and family, keeping Locale and Urban Pantry in Manuka. Muscat has clearly spent a lot of time thinking about what customers want Locale to be, and how they’ll use his pizzeria. 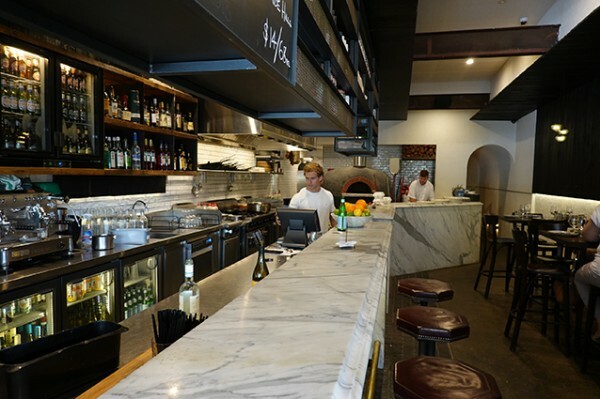 Deciding on a Roman style base (so it stands up to takeaway and delivery) Muscat took his key staff to Sydney to be trained by Ventuno in Walsh Bay. 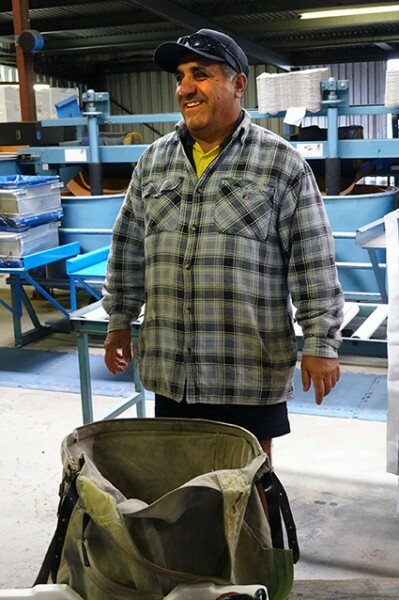 With a 48-hour proofing process, his own dough began its journey with theirs as a starter. 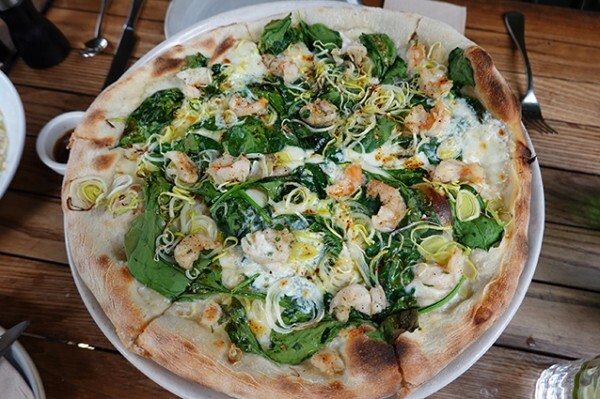 It’s tasty and easy to digest on your must-try pizza – the Gamberi ($25) – which is actually the best prawn pizza I’ve ever eaten. 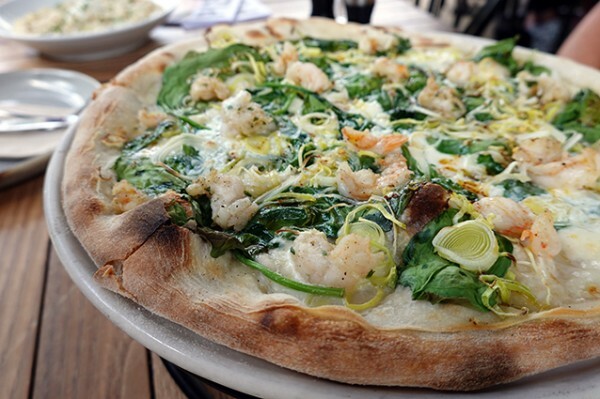 It’s eye-catchingly green, with still-juicy prawns, spinach, mascarpone, chilli oil and fior di latte, plus slivers of leek that’ll have you wondering why don’t we see more leek on pizza! 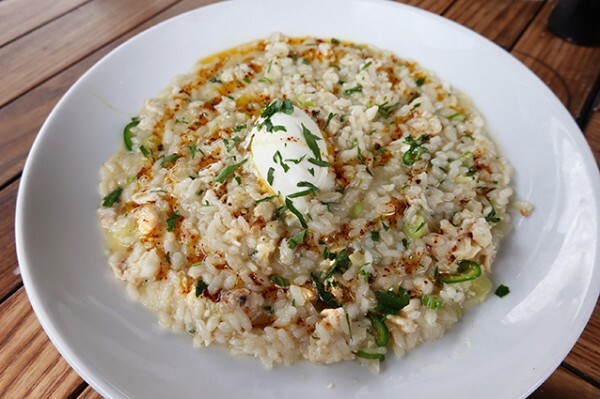 We teamed our pizza with Risotto ($34) made with Fraser Island spanner crab, Moreton Bay bugs and spring onions. With toothsome rice it’s light, lemony and likeable, with lively green chilli bite, that keeps it bright and summery rather than nutty, creamy or stodgy. 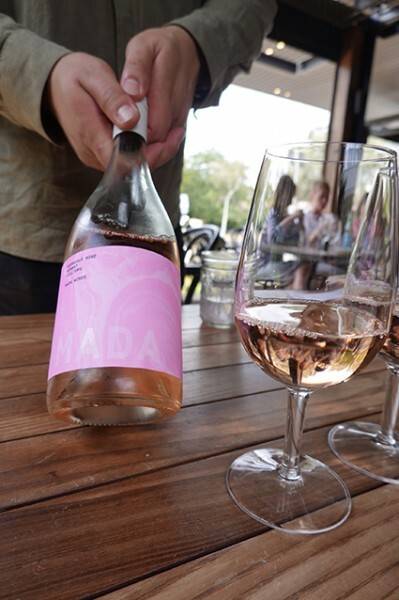 Against another local - the Mada Wines Nebbiolo Rose ($11/glass) - the two dishes seem to be made for eating together, like a fist in a glove. 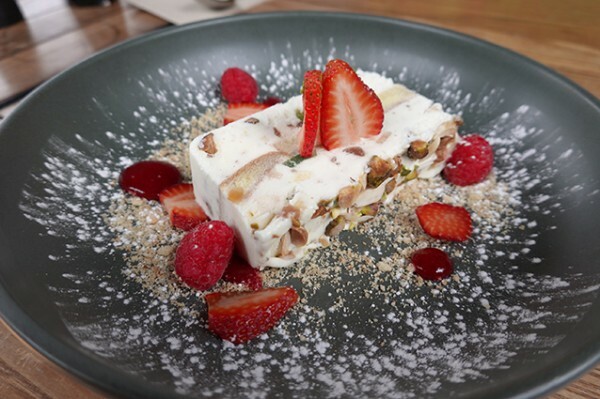 Kicking back over coffee and Cassata di Casa ($14) made by Muscat’s pastry-chef Mum, you can colour me impressed. Not only is this nutty vanilla bean ice cream dessert a particular winner (generally, I don’t even like cassata), so is the whole package. 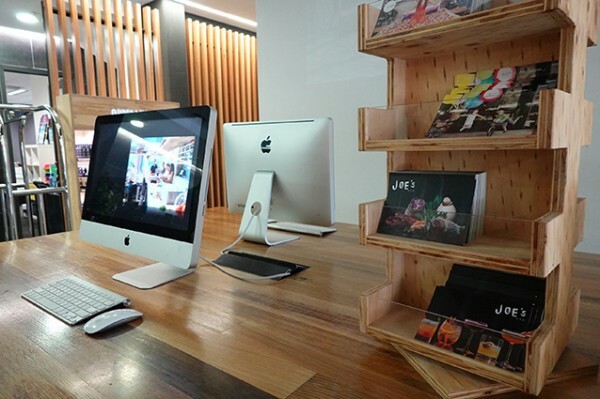 Locale is the product of a confident owner, smart enough to aim directly at being a mid-range community hub rather than being famous. We'd all be lucky to have a focused, local pizzeria of its calibre. 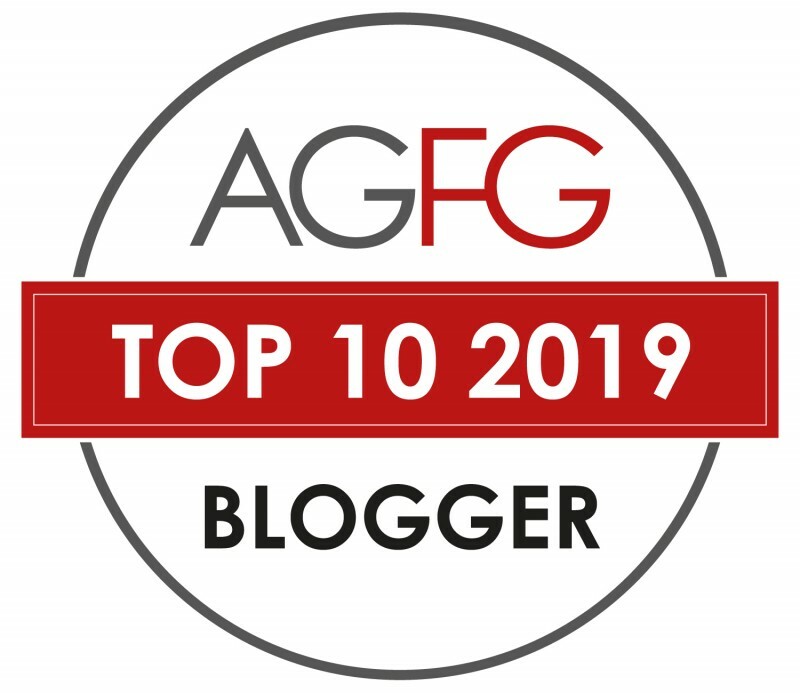 Thanks to AGFG for arranging my visit. 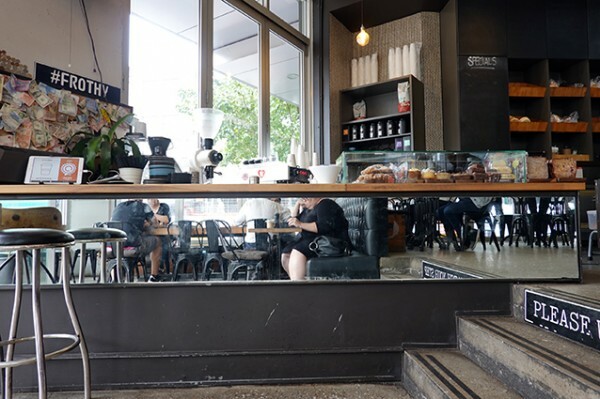 After a terrible lunch at Bread & Brew – too bad to even bother reviewing – I’d written off this glass-fronted corner café in lower Surry Hills. 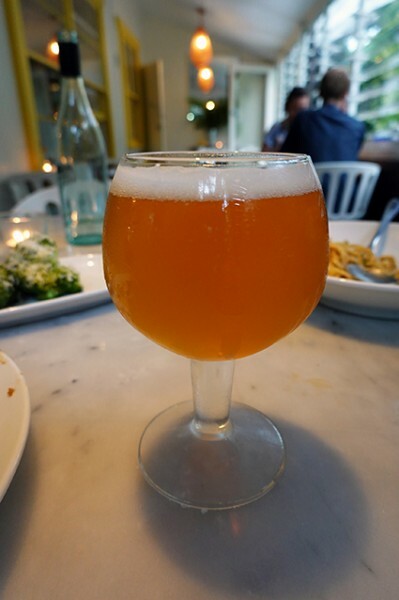 So complete was my dismissal, it took me months to even notice the name change to Frothy; and some extra time to shake off the negative connotations I had from the previous venue. 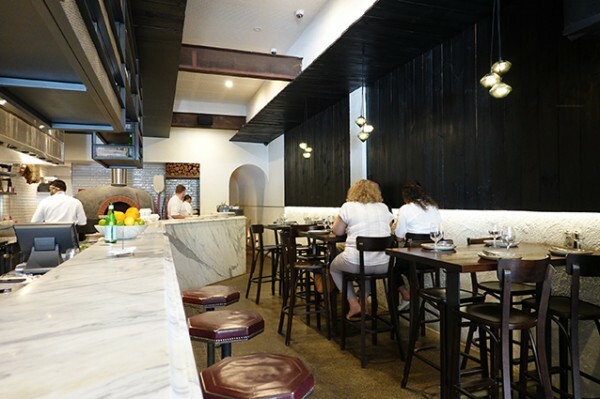 Once you navigate around Gladys Berejiklian’s over-time and over-budget light rail disaster, you’ll find a stark modern space with exposed hipster bulbs and a polished aggregate floor. 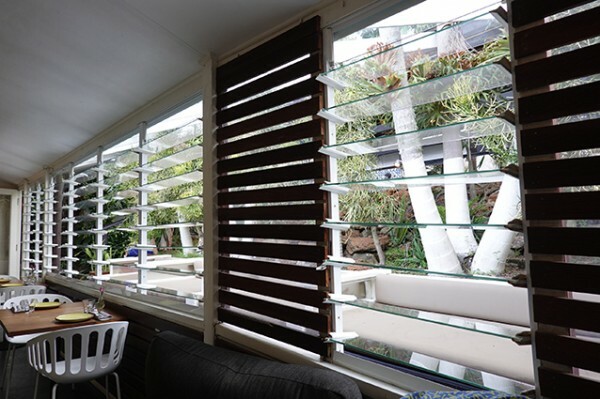 With windows on two sides, it's more set up for people watching, than it is about internal decor. 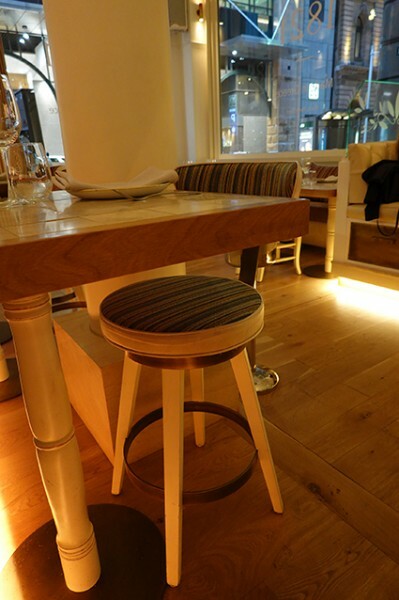 Stripped wooden tables on old-fashioned metal stands are covered in circular burns, prompting me to order coffee. 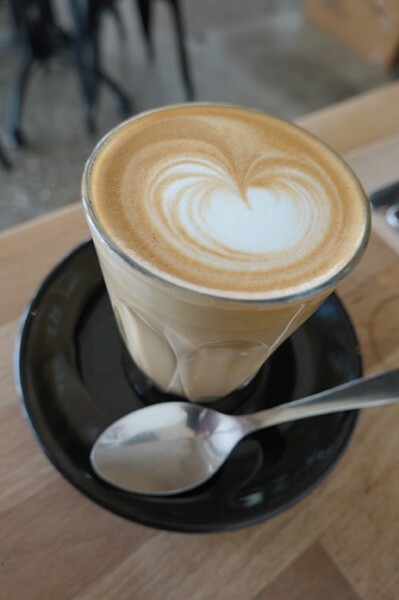 The beans are roasted by Seven Miles Coffee Roasters in Manly Vale, which is actually Belaroma Coffee rebadged and refurbished. 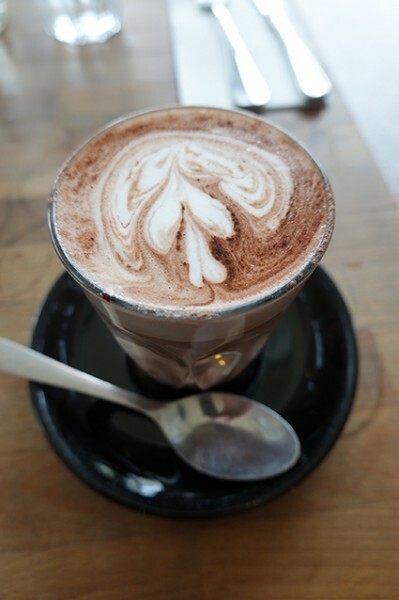 It has a burnt aroma in my Latte ($4) but drinks fine even if it doesn’t smell delicious. With winter rapidly encroaching, on my second visit I switch to a Hot Chocolate ($4), which was not served hot enough for my liking. 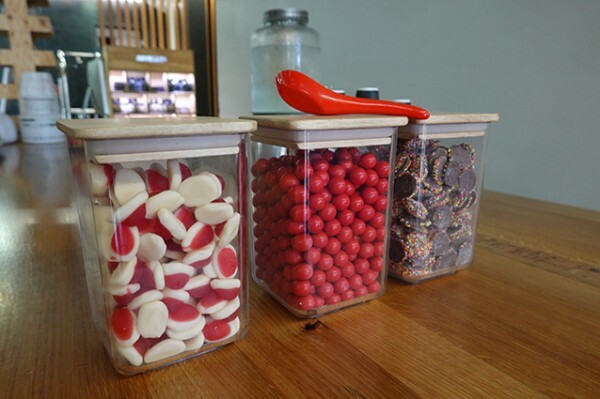 Ordering is done from a tatty menu at the shiny front counter, adorned with a good-looking collection of bought-in pastries and cakes. 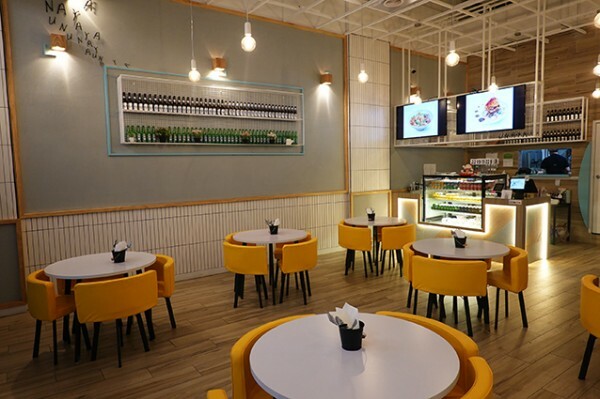 Next to it sits a glass cabinet full of pre-made sandwiches, and behind that, a small open kitchen where a limited amount of cooking can be done. 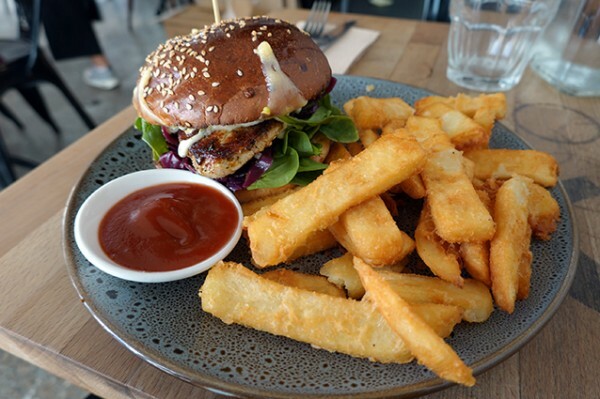 If you sit up the back you can see the frozen chip bag come out of the freezer for the Chicken Burger ($12) chalkboard special, though the resulting beer-battered chips are better than I expected. 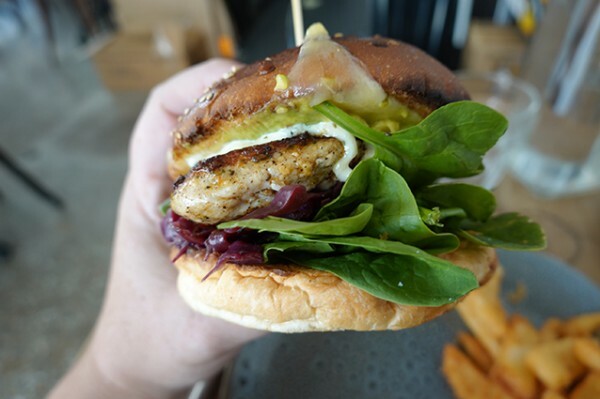 With smashed avocado smeared on one side of a decent bun covered melted cheese, the marinated and grilled chicken fillet burger is good enough for a workday lunch, fleshed out with enough red cabbage and baby spinach to make it feel fresh. From the all-day breakfast menu that stops with the kitchen at 2.30pm, I give Green Eggs ($15) a whirl. 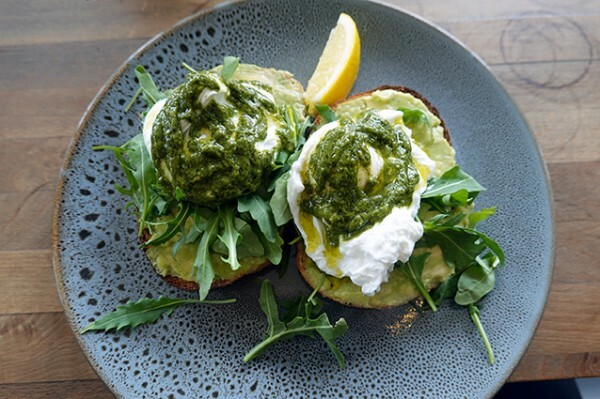 It’s an avocado smash tarted up with poached eggs, rocket and pesto. It’s under-seasoned and thus a bit boring, with no salt offered on the table to correct the omission. The staff at Frothy show a lot of personality, and, perhaps as a result, their patrons look very comfortable in their space. At one end of the thick wooden communal table a couple are intently focused on a chess board, while at the other end, it is peak-NGO with a business meeting about how to get super funds not to invest in coal. 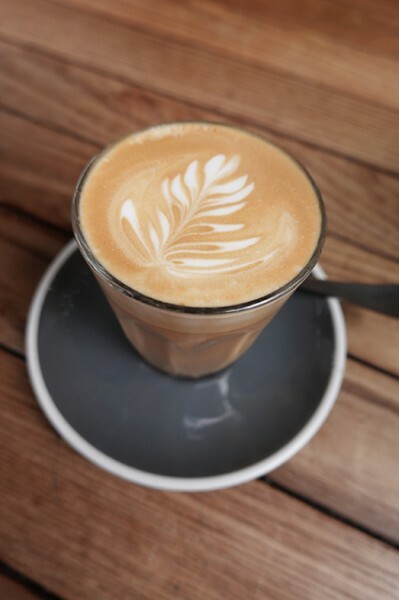 One man sits facing the coffee machine chatting to the barista as he waits for his coffee, while a second coffee buyer asks the barista how long before his next holiday? 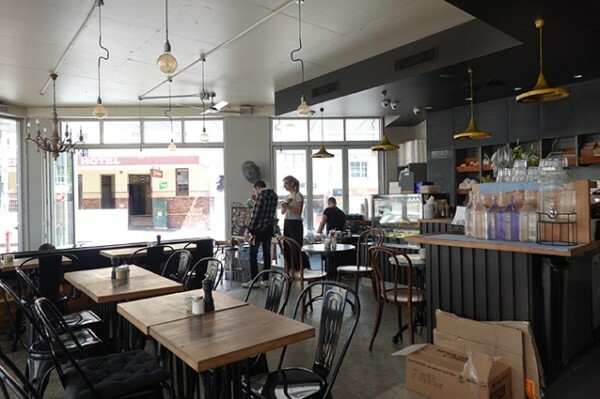 While the food at Frothy didn’t strike me as anything special, I can’t deny that this cafe has made a strong connection to the community that they serve. 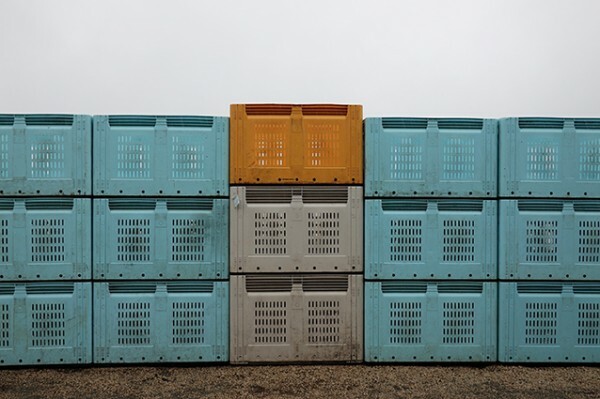 It’s drizzling as I walk among Joe Saliba’s orderly rows of apple trees. Grown on dwarf root stock - little trees planted close together - they’re smaller than I imagined. In fact, they look more like vines that might fall over from the weight of their glistening, rosy apples if they weren’t fastened securely to trusses. 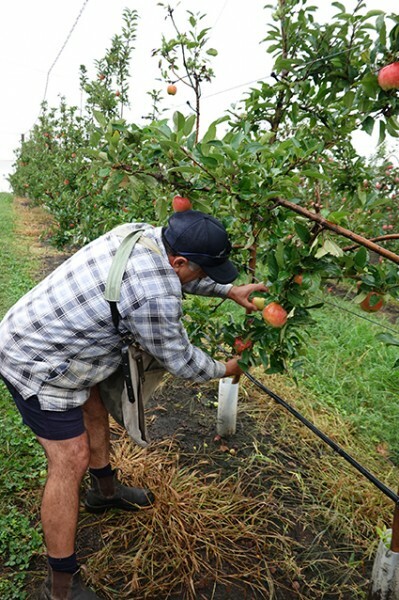 Less tree makes for easier access for Joe’s apron-clad pickers, though they still have to use a motorised cherry picker to snaffle the apples that grow too high above their heads. 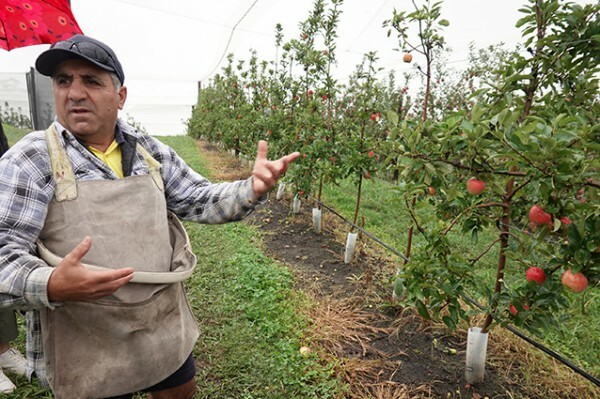 Joe is a second-generation apple grower. 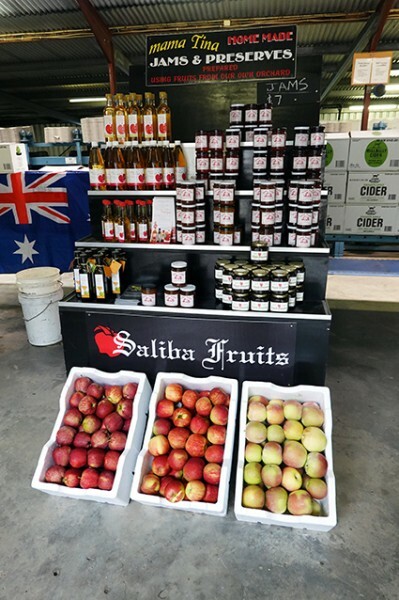 Saliba Fruits was started by his father Colin and his brothers, and eventually passed down to him. 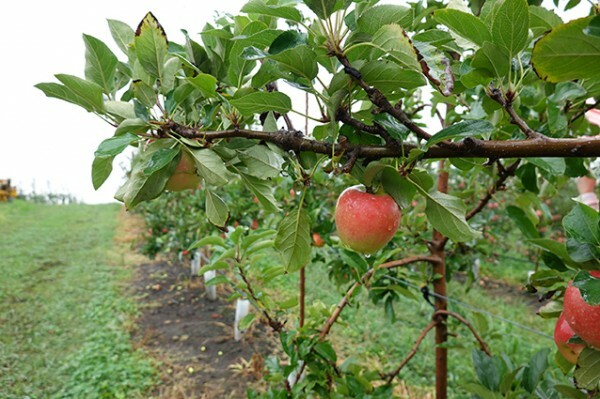 The Saliba family have been growing apples on this property for 47 years. 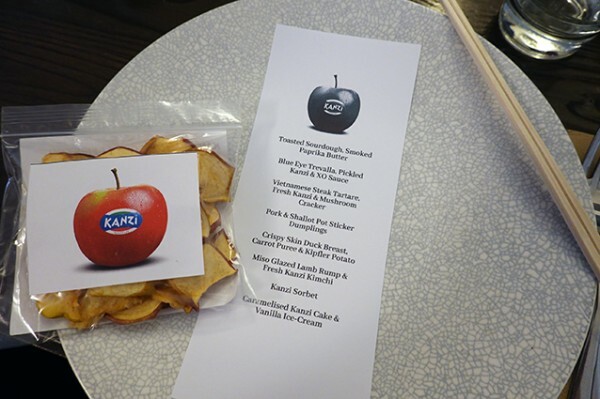 They haven’t always grown Kanzi apples though. 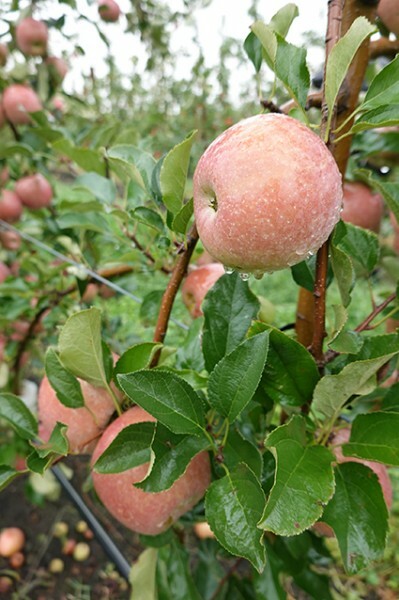 It’s a European cultivar, a cross between the Royal Gala apple and the Braeburn apple, though we got our first peek at them in 2007 when they were planted in Manjimup in Western Australia. 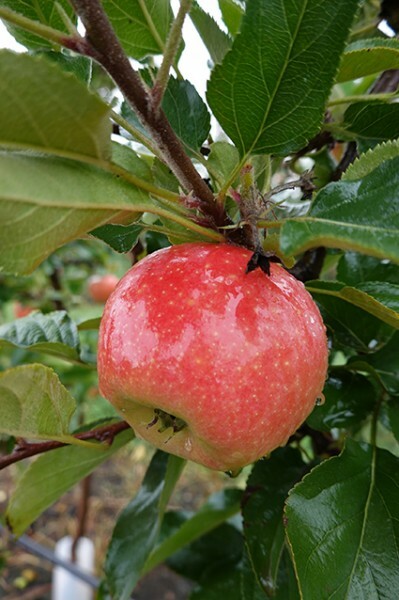 The Kanzi apple is one of the most beautiful apples I’ve ever seen. It’s fat, round and heavy (one of the ones we picked weighed in just under 500 grams). When you bite into it, the creamy white flesh is crisp and juicy, balancing sweet and sour perfectly. The Kanzi's reddish-yellow skin sits somewhere between the Granny Smith’s green apple skin (which I like) and that of the Red Delicious (which I don’t). 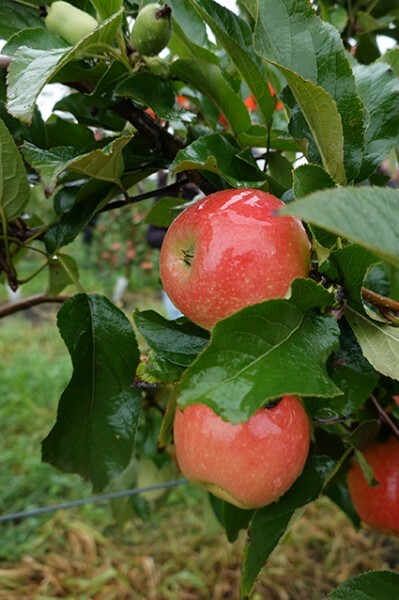 After we move back into Joe’s apple shed, I try the Kanzi apples side by side with rosy-hued Fuji apples (grown on the neighbouring trees) and redder Jonathan apples. It scrubs up better than both. 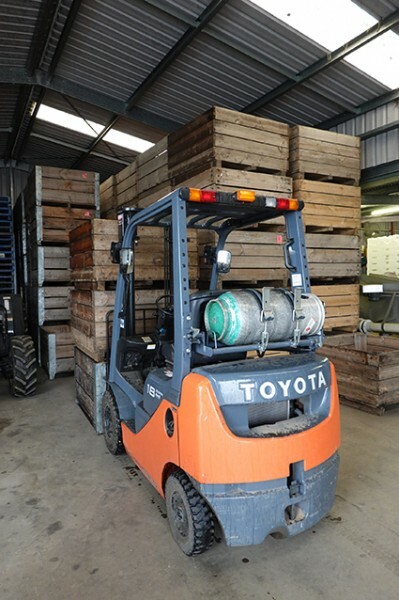 While these days Joe Saliba puts his apples straight into crates and whisks them off to Batlow in a refrigerated truck for sorting and shipping, his shed still contains all the machinery from the orchard's D.I.Y. days. 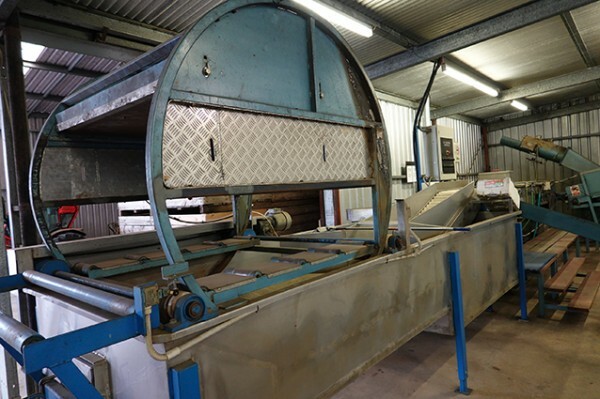 The first machine we see washes the apples, then they’re dried as they're zoomed along a conveyor belt. 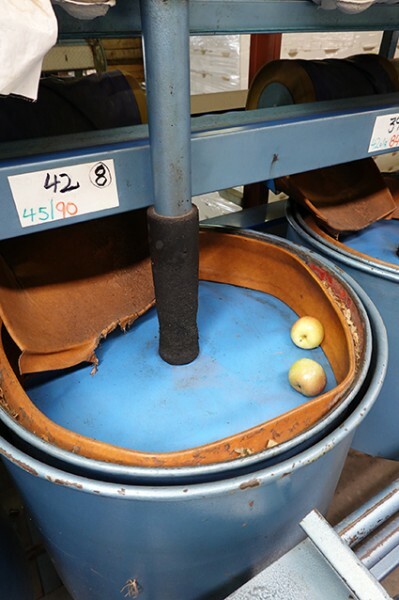 The next apparatus sorts the apples by size, with bigger being better in the apple world. 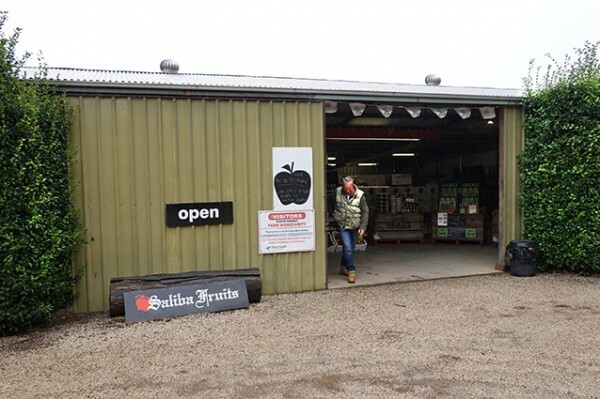 Joe turns it on so I can watch the apples bouncing by, while his wife, Lilly, explains the rest of their farmgate store. 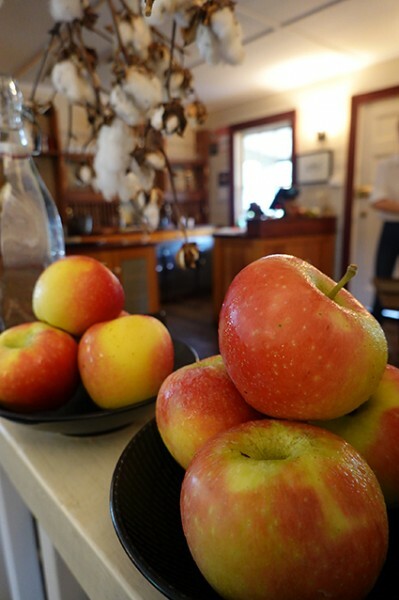 The key item is of course their apples, freshly picked for four bucks a kilo, bar for the Kanzi apples, which at five bucks a kilo, are still a bargain at the price. 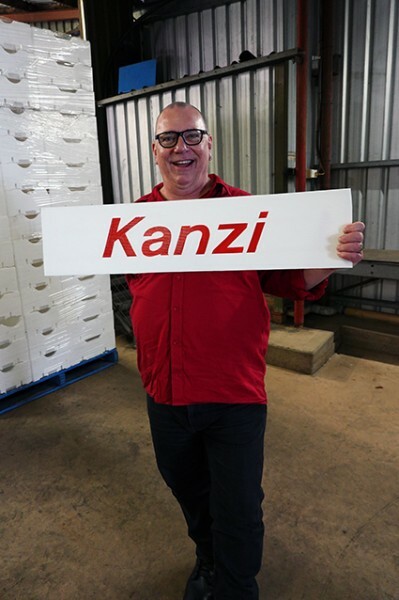 They’re a very seasonal business – you can only buy apples when they’re in season, and for Kanzis, that season is now. 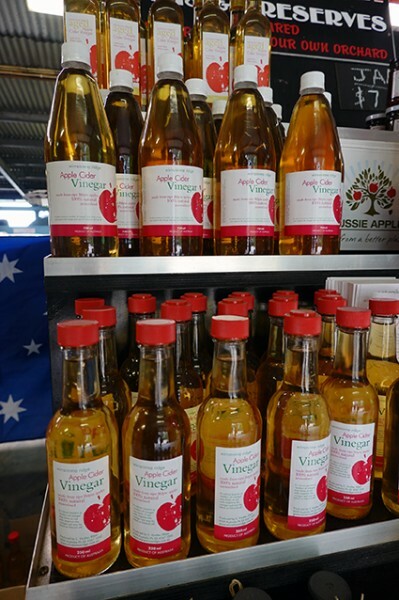 You’ll also find a range of products made from apples, from Hillbilly Cider (the non-alcoholic version), Wirraninna Ridge Apple Cider Vinegar and Bilpin Bush Honey. 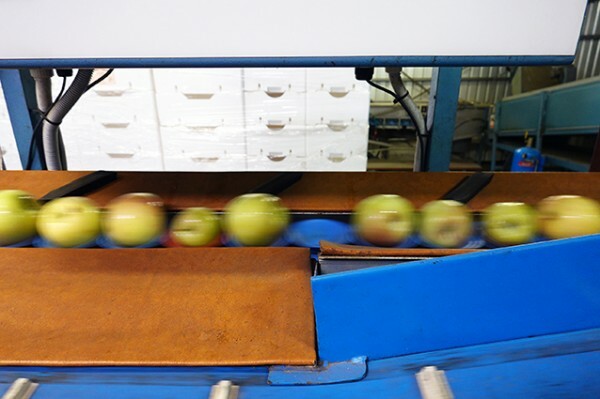 More than just a collection of apple-related products, many of the products are produced through collaborative farming with Saliba Fruits. The honey comes from The Hive, just up the road in Berambing. 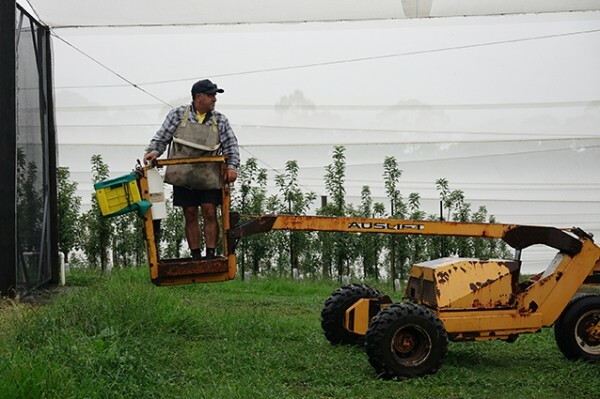 They bring down their hives so their bees can pollinate the apple trees, and in exchange, the Saliba family sell their honey to their farmgate visitors. 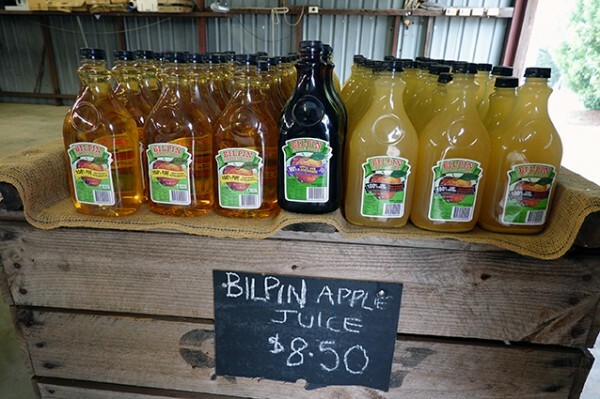 Juice fruit goes to the vinegar lady at Wirraninna Ridge, and to the cider people, though you can also buy marked, bruised or finger-printed fruit by the box if you like to cook them at home. Nothing is wasted. 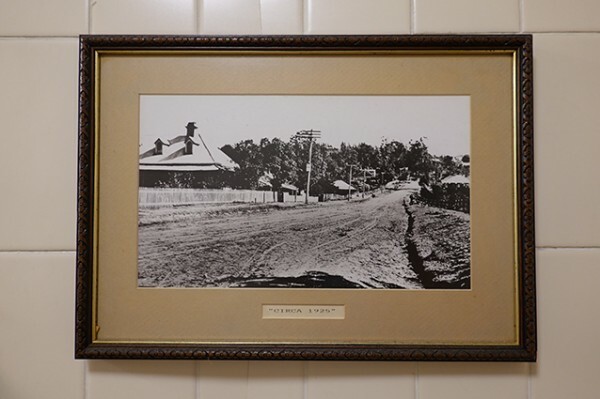 We nip back down the Bells Line Of Road to Kurrajong Heights and have the folk at Lochiel House do the cooking for us. 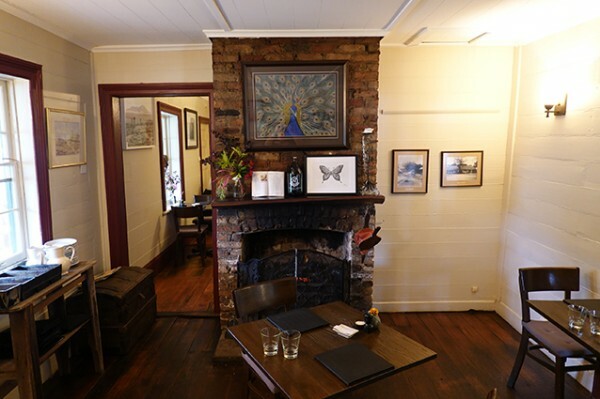 The cottage itself was rebuilt here nearly two hundred years ago back in 1825 after being imported all the way from Scotland. 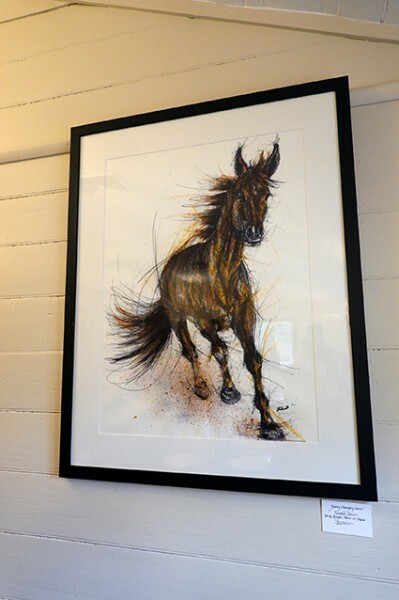 In its current incarnation, it’s co-owned by Tayla Clout and Nathan Parker, who are 23 and 26-years-old respectively. 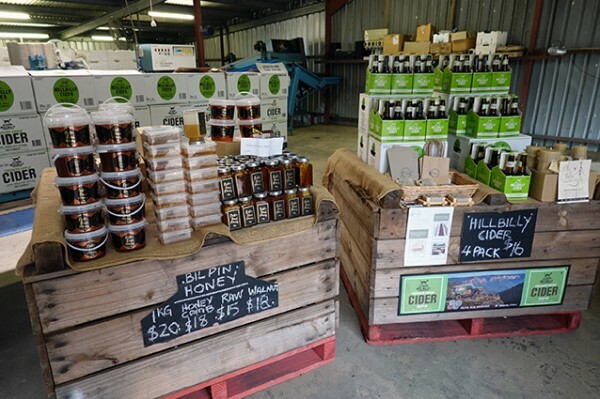 Everyone who works there is local, including our personable 37-year-old waitress, who explains - as she's pouring our cider - that it’s actually her second stint on the Lochiel House floor, the first being when she was just 15-year-old. 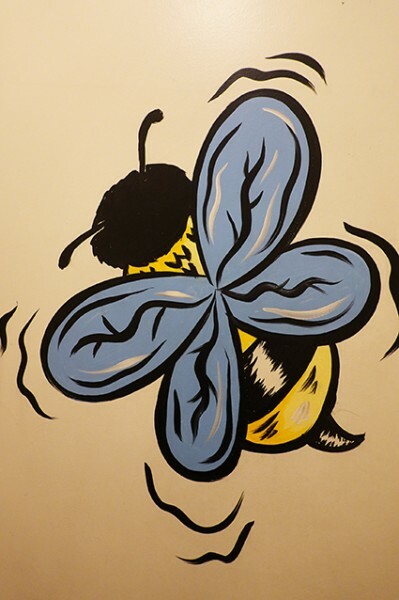 She lives within walking distance of the restaurant, and walks them over honey from her own hives. 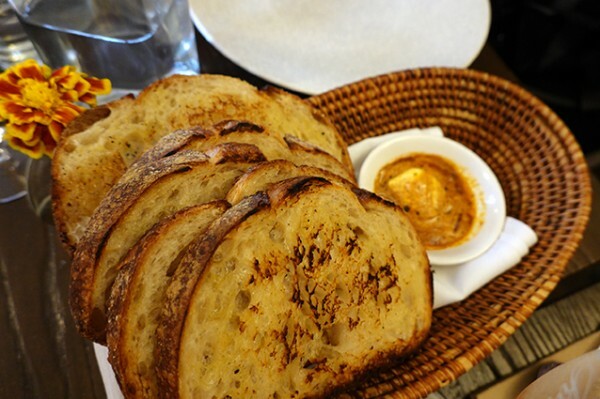 Kicking off with Toasted Sourdough with Smoked Paprika Butter ($3) our menu is one-part homage to the Kanzi apple, the other part a peek at what this restaurant has made their name serving. 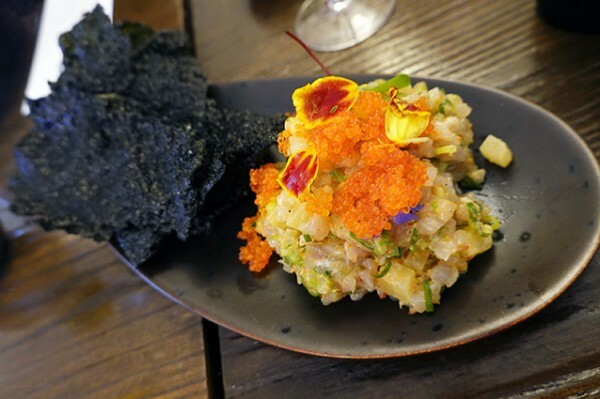 Obviously, with my fingers so recently caressing their shiny skin, I’m most interested in dishes featuring Kanzi apples, like the opening blue-eye trevalla tartare that uses XO sauce to bind the delicate raw fish to pickled Kanzi apple. Topped with bright orange roe and edible blooms, and eaten from squid ink crackers they make in-house, it's actually my favourite dish. 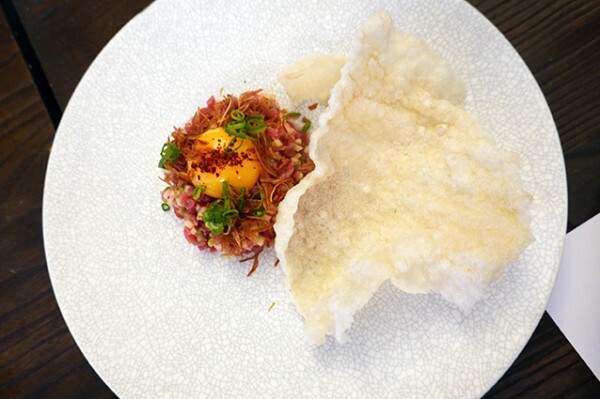 Over our Vietnamese Steak Tartare ($23) from the Lochiel House regular menu with slight Kanzi update, I get chatting with chef RJ Lines who believes the Kanzi apple has a special affinity with raw seafood. 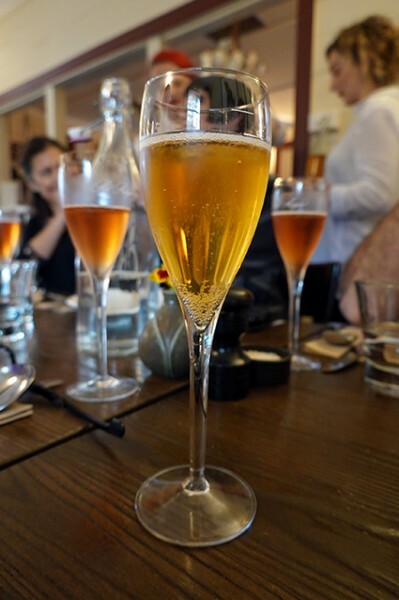 That’s how he serves it at his restaurant One Penny Red in Summer Hill. He's got a bag of apples in his hand to take back so all his staff can try them picked straight from the tree. I find the kanzi works for me in a similar way to nashi pear, hence I quite like eating it with raw beef though I personally would have taken a Korean path and thrown some gochujang into the tartare mix. 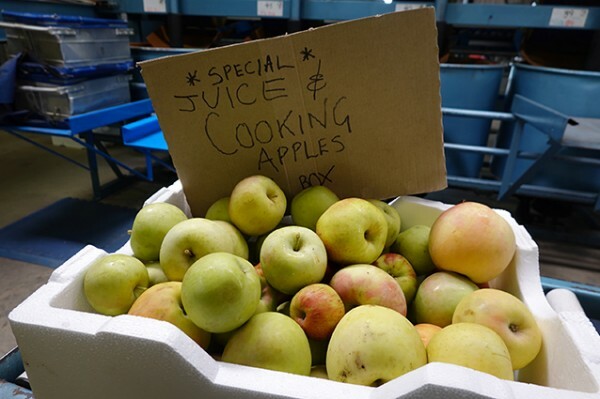 Lots of the produce we’re eating comes directly from the restaurant’s kitchen garden or the surrounding 'hood. 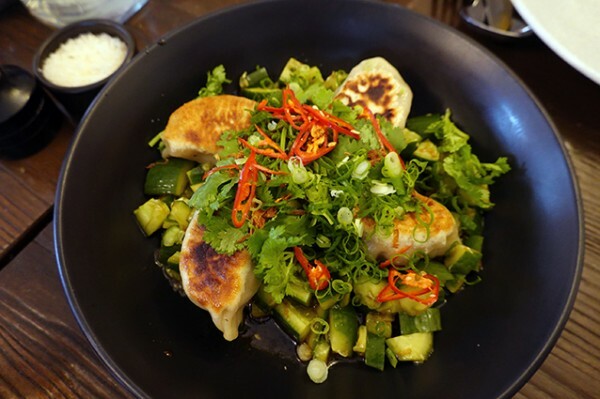 Pork and Shallot Pot Sticker Dumplings ($23) arrive in a bouquet of vibrant green herbs and juicy wet cucumber. Their plump, pork-filled interiors gain admiration at our table, especially as they’re contained within reasonably delicate skins. The black vinegar dressing and chilli levels are at an accessible, please-all levels, and, like the rest of the menu, pitched not to be challenging to the plain eater. 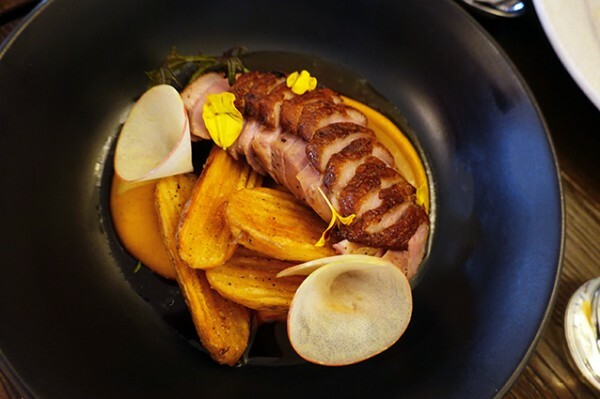 Crisp Skin Duck Breast ($37) with carrot puree, dashi broth and crisp kipfler potatoes is perfect for the misty, drizzly day. 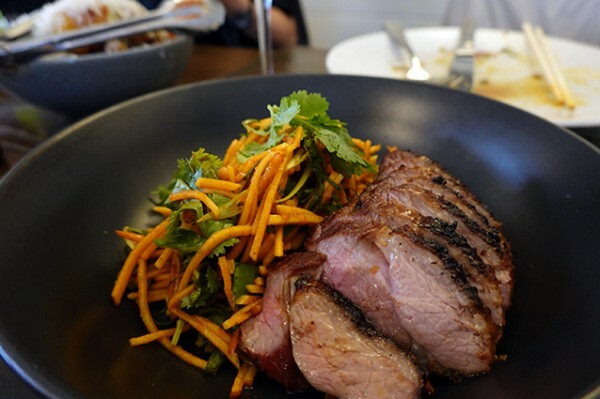 Miso Glazed Lamb Rump ($36) served pink with an even better crisp skin, is given a Kanzi twist with what the kitchen calls a Kanzi kimchi. While it didn’t win me on funky fermentation, this salad showed the Kanzi apple’s potential for autumnal ‘slaw. 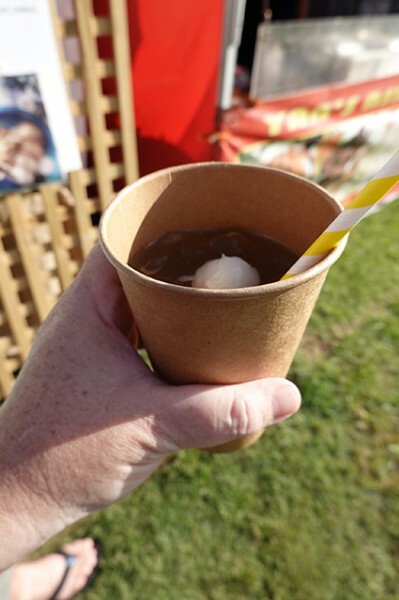 While our Kanzi sorbet had a floury texture from the pulp not being adequately strained from the juice, I enjoyed the caramelised Kanzi cake. 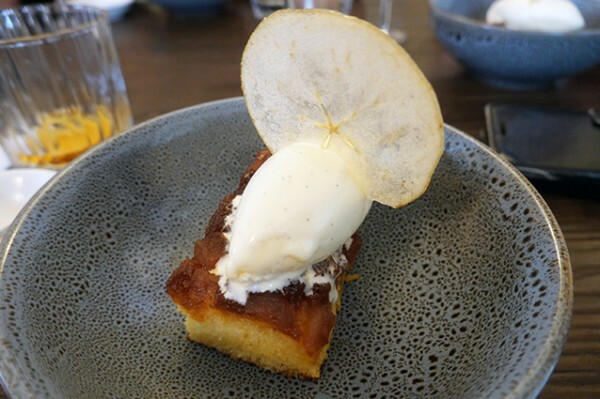 Despite the dehydrated Kanzi plume and elegant quenelle of ice cream flecked with vanilla bean, it's the kind of cake your Nanna would enjoy, and shows off the apple's potential for a variety of cooked uses. 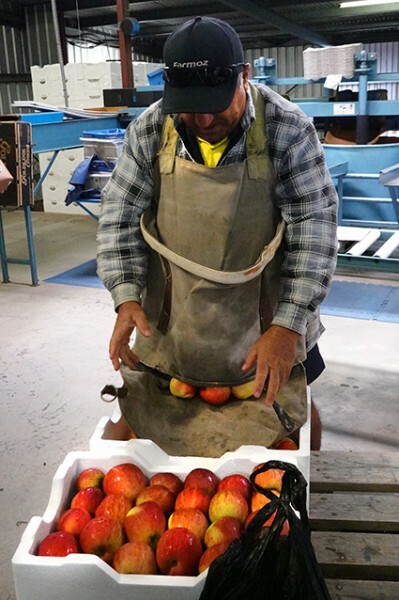 Energised from our day following the Kanzi apple all the way from orchard to plate we hit up Harris Farm Leichhardt at just the right moment to watch them unpacking new season Kanzi apples on the weekend. 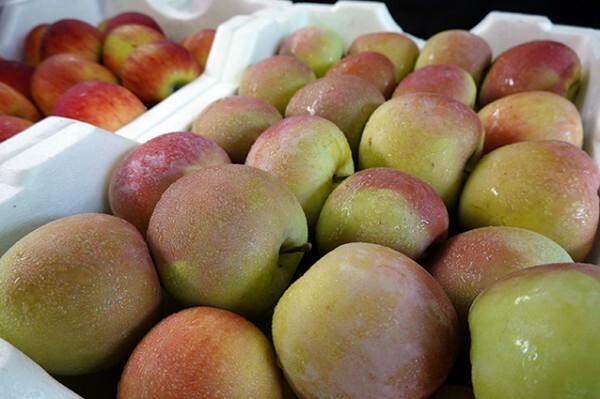 You can pick them up at $6.99 per kilo, as opposed to the $5 per kilo we got them for at Saliba Fruits. Needless to say, they’re so delicious, we bought some more anyway. 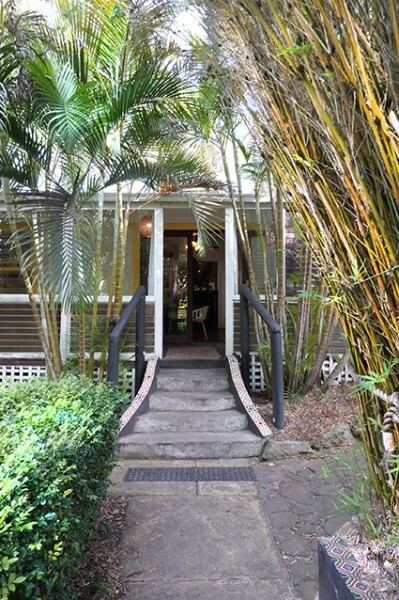 Tucked into the hillside between Kincumber and Avoca Beach, you’ll find a beautiful old plantation house – one of the Central Coast’s oldest homesteads in fact – sitting under a canopy of subtropical foliage. 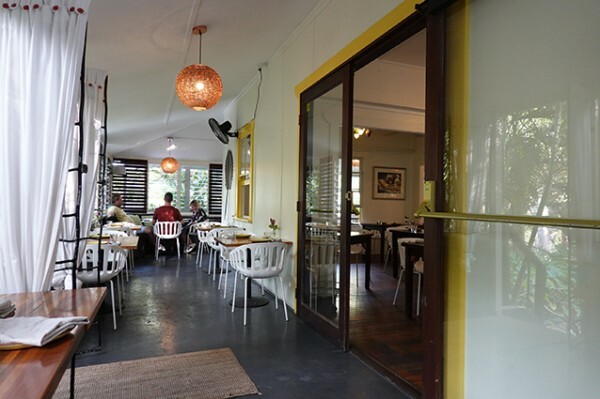 The terraced two-acre property includes a chook pen, some pigs and a kitchen garden, along with plenty of off-street parking. 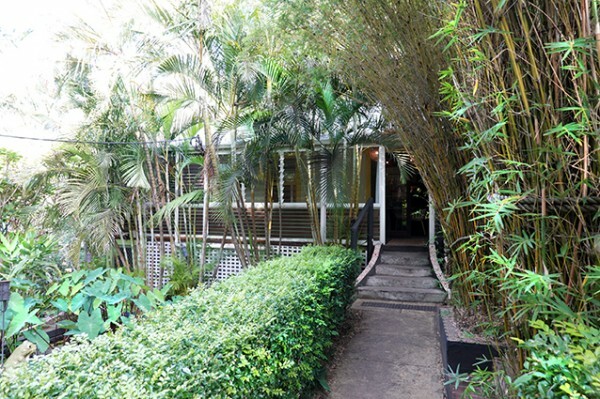 The manicured bamboo-lined entranceway leads you past a fish pond on the way to the main house. However you'll find diners scattered throughout the house and grounds. I'm told on a busy Saturday night in summer that can mean 120 inside and another 120 outside over the course of the evening. 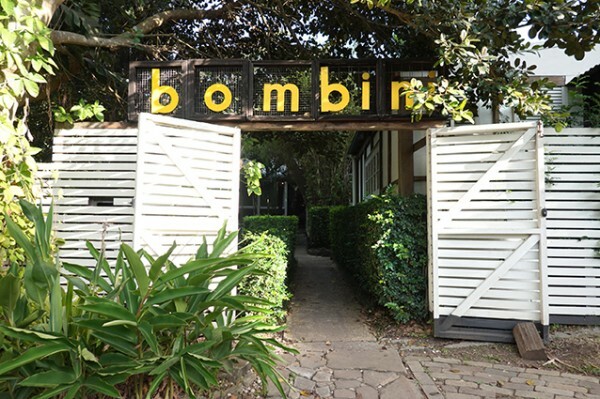 You'll find casual eaters hitting up the Bombini Pizza menu in the large undercover terrace that houses their pizza oven. 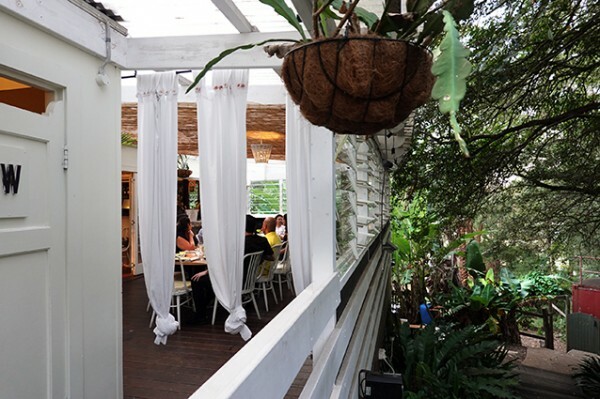 Raucous laughter rings out from a family happily ensconced in their own outdoor pagoda for a shared meal; while a big party of young people have taken up residence on the back deck. 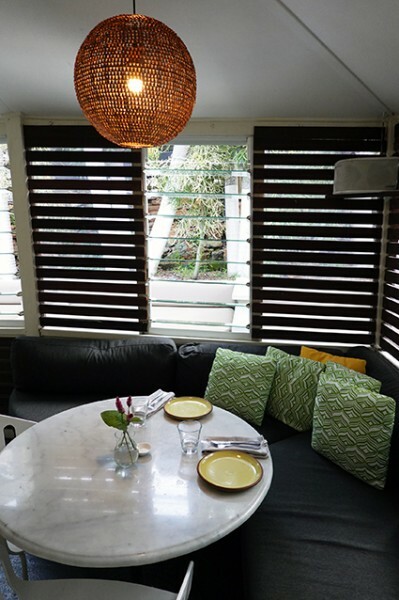 The louvred verandahs of this airy Queenslander house some more intimate spaces, where you and your beau can cuddle up in a cushioned corner banquette or sit facing each other with only one or two other tables in your eyeline. 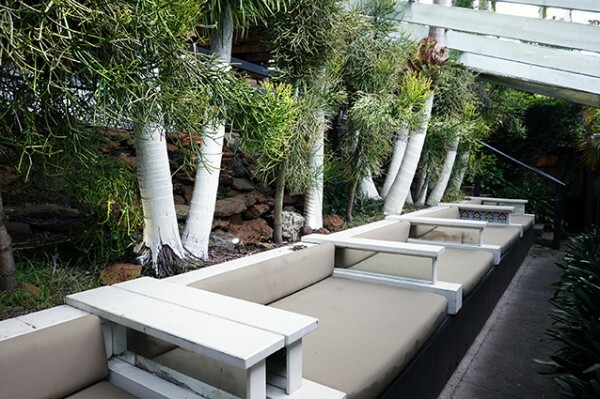 There’s even a row of day-beds, nicely framed by whitewashed palm trunks dripping in staghorn ferns. 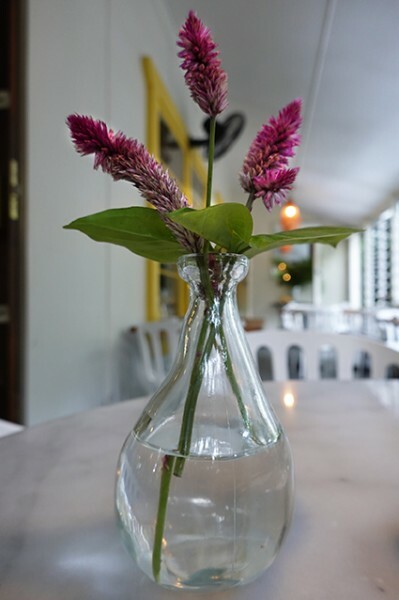 Across all the spaces, relaxed Sunday tunes help you say farewell to another fine weekend. The setting is enough to make you feel like you’d taken a holiday from your life, so I extend those holiday feels with a Cocobomb ($18). This easy-to-like cocktail shakes coconut tequila, 1800 Anejo tequila, pineapple and agave syrup into a martini glass. Equally easy to drink is the Bombini Mule ($15) that muddles up spiced rum and Havana Club Añejo 3 Años Rum with ginger beer, mint and lime. We kick back with our drinks and enjoy the airflow on this balmy evening, me with a whiff of the ocean from a swim at Pearl Beach still in my hair. 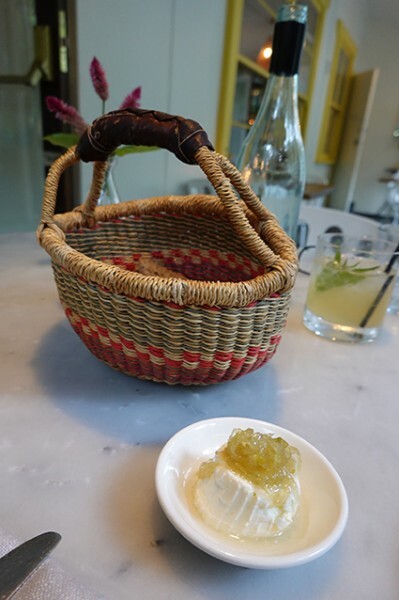 Owner/chef Cameron Cansdell has a make everything in-house philosophy that you’ll get better acquainted with over his opening basket of bread. 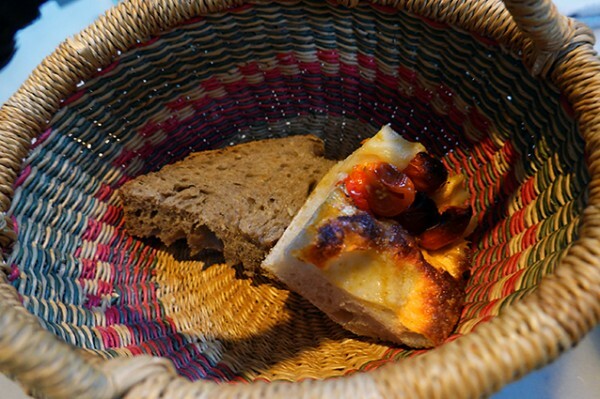 The house-made tomato focaccia goes down a treat with the accompanying ricotta and fennel gel. Thankfully Cansdell only gives you enough bread to whet your appetite because the mains that follow are generously proportioned. Inspired by my day by the sea, I kicked off with Yellowfin Tuna Crudo ($29). 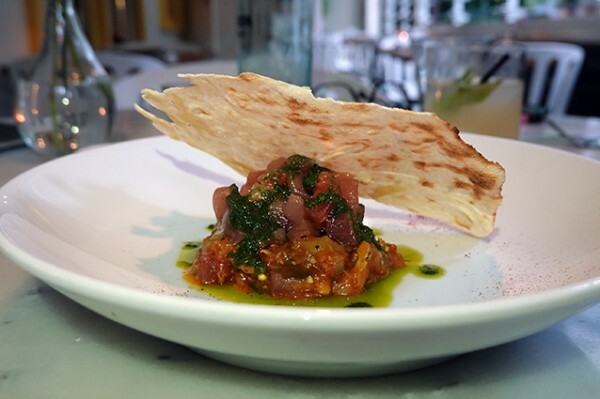 Hidden under a crisp shard of Sardinian flatbread (pane carasau) it’s an unusually bright and acidic raw tuna dish, tempered by basil oil. My dining companion is a sucker for Iberico Ham ($35). At Bombini it’s finely sliced and laid across a plate with four well-blistered padron peppers (one of which was actually hot, making them better than any of the ones I’ve had in Sydney this year) and breadsticks. 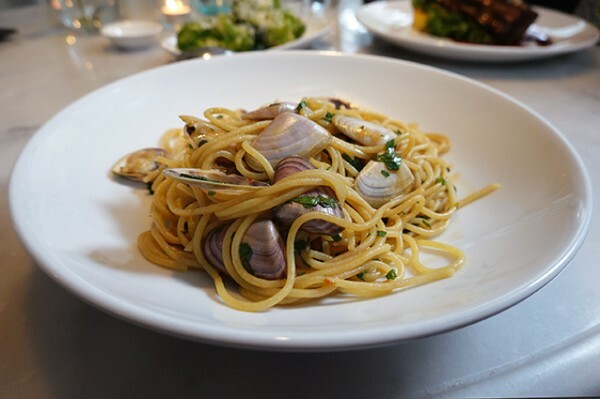 Cansdell also makes his own nicely textural Spaghetti ($38) then tangles it up with the bounty of the sea - pippies and garum di tonno. The pungent fish paste is balanced with garlic, lively chilli and parsley for an accessible and enjoyable dish. 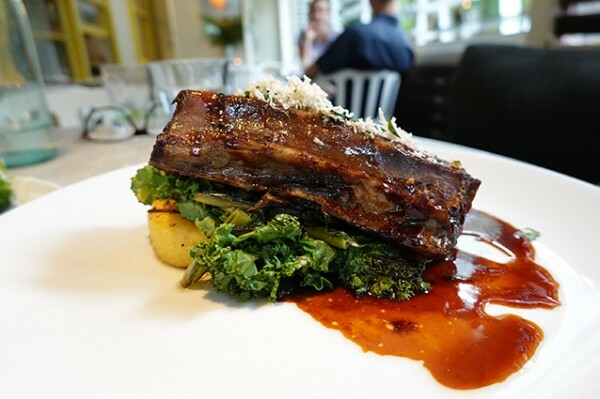 Cooked for seven hours, the Brooklyn Valley Beef Short Rib ($42) will stonker you into submission, perfect for the hour and half drive back to Sydney while your body digests. It’s served with lovely grilled Italian polenta, bitter chicory (to help you digest) and horseradish to enliven the palate and ensure you eat your way through the thick slab of beef. 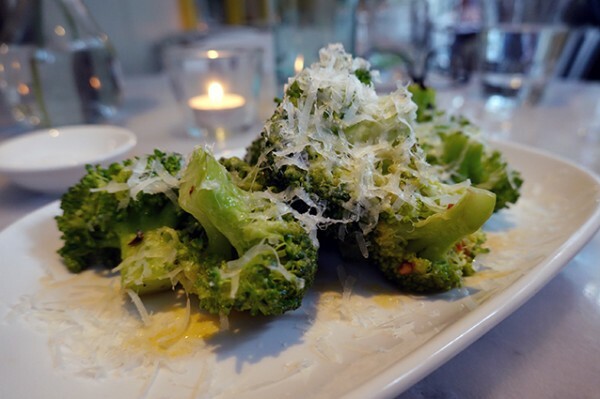 Broccoli ($9) dusted with Grana Padano and lightly tossed with garlic and chilli was entirely superfluous to our needs. 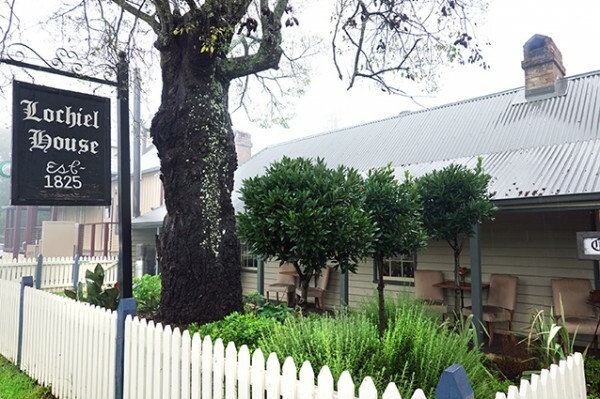 While Bombini is pricy, at least by Sydney standards, it’s such a pretty destination you’re likely to leave on high, especially if you tackle their Bombini Raspberry & Cream ($19) before you drive back. 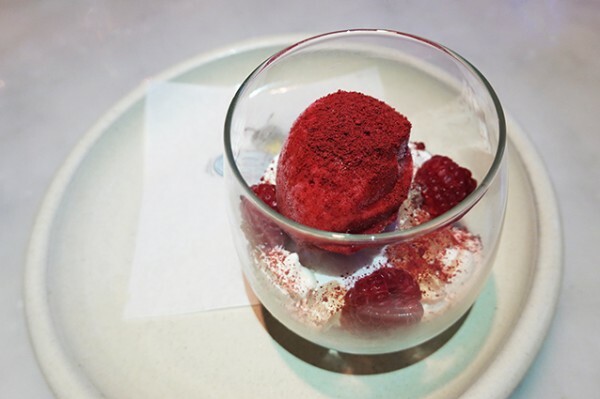 This pretty little verrine of soft poached meringue, prosecco jelly and tart raspberry sorbet sprinkled with freeze-dried raspberry powder, has been on the menu since Bombini opened, and it manages to be a great palate cleanser even with the cream. 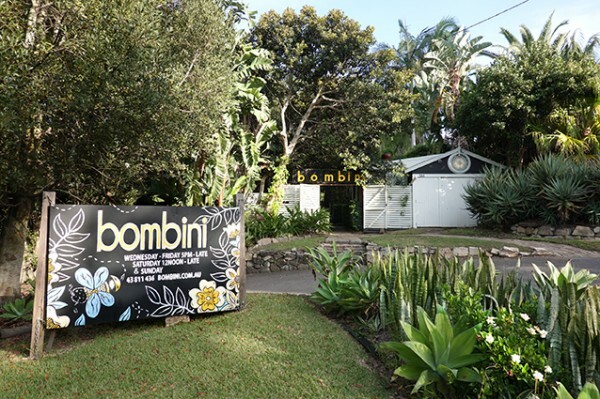 Did I mention Bombini is just an hour and a half from Sydney’s Inner West? 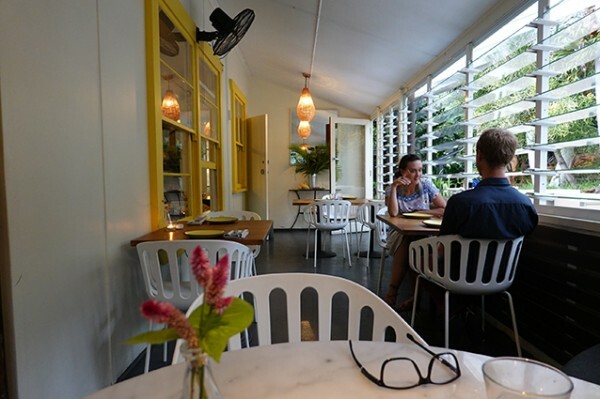 Reviewing restaurants provides me with a great reason to visit Sydney suburbs I might not get to otherwise. 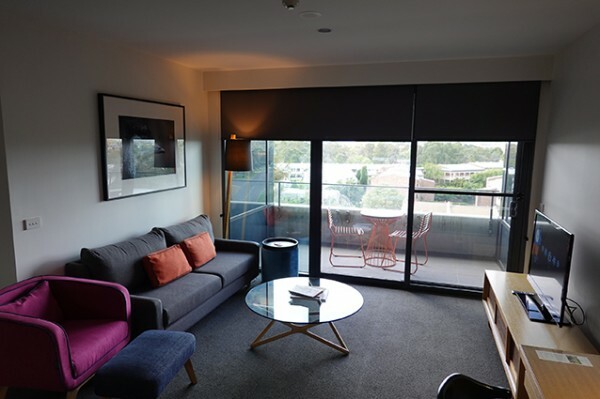 Today’s review is in Wentworth Point, an unusual, eight-block, medium to high-density living suburb wedged between Sydney Olympic Park and the Parramatta River on two sides. One waterfront is natural, the other is an artificial shoreline separating Wentworth Point from Rhodes, that was previously known as Homebush Bay. 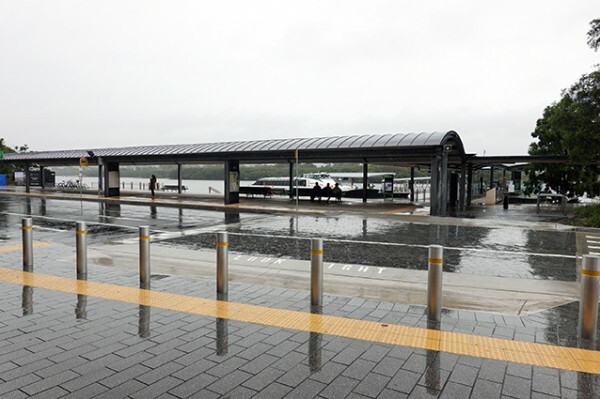 With all this water frontage, such that it is, the most fun way to visit Unaya would be via the Parramatta River ferry services. With the Parramatta River already earmarked by the Shorten Labor Government as a prime candidate for their urban river renewal project restoring the natural beauty of our waterways, jumping off at Sydney Olympic Park ferry wharf is only going to get more attractive. 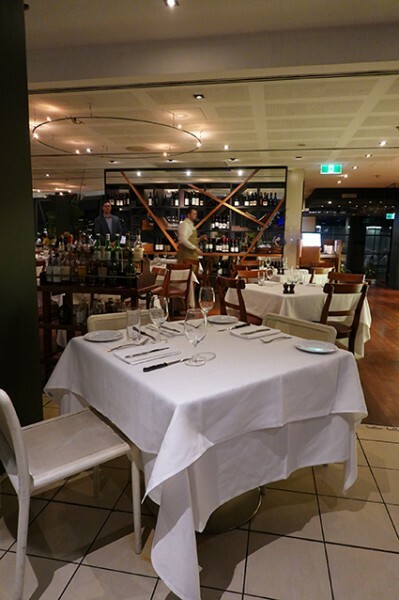 You’ll find Pierside Wentworth Point right across the road from the ferry wharf. 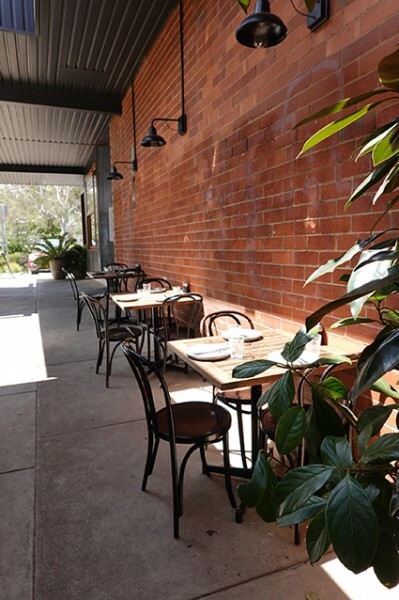 Two rows of restaurants, medical and retail are joined by a covered al fresco dining area. 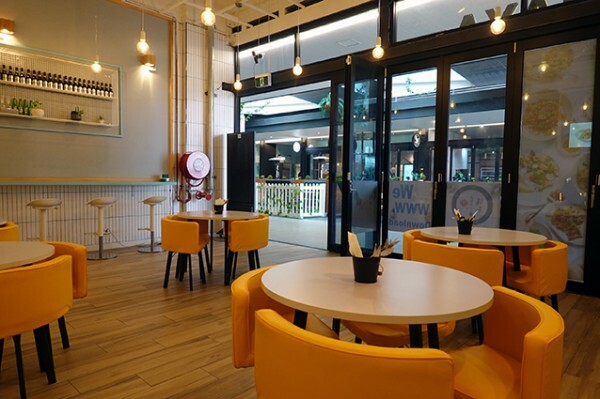 The whole development sits on top of a hundred spaces of underground parking, that you can access for free for two-hours if you happen to come in your vehicle. 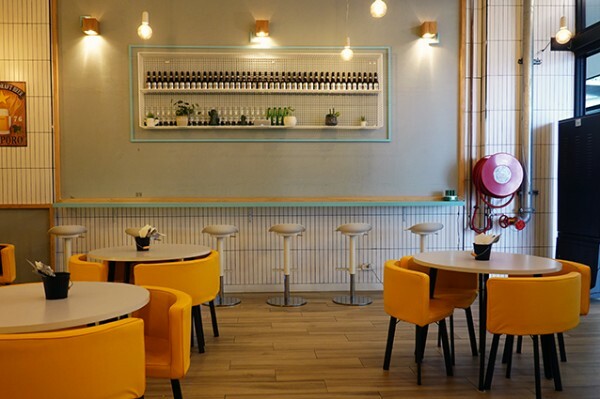 Unaya is a sunny looking space, with padded, yellow wedge of cheese chairs neatly tucked under well-spaced, round white tables. 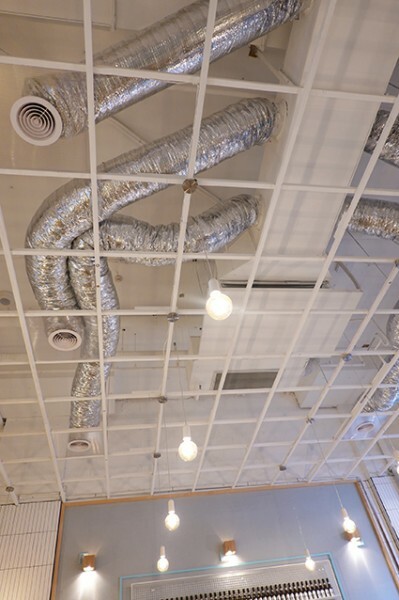 Above your head, you can see the guts of an air conditioning monster extending its tentacles across the room, and the requisite dangling hipster bulbs. Vertical white tiles and rows of bottles are made into wall features, with chaotic lettering stopping the place from seeming too orderly and neat. 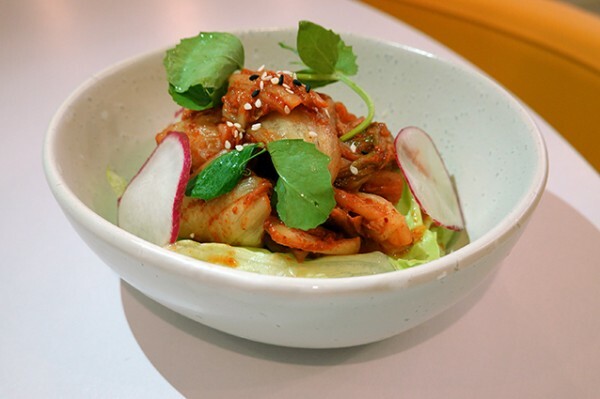 The menu is an unusual combination of burgers and rice bowls, fusing together Western and Asian cuisine. “I developed this brand with a friend of mine who is from Japan, and we have been known each other for 15 years. 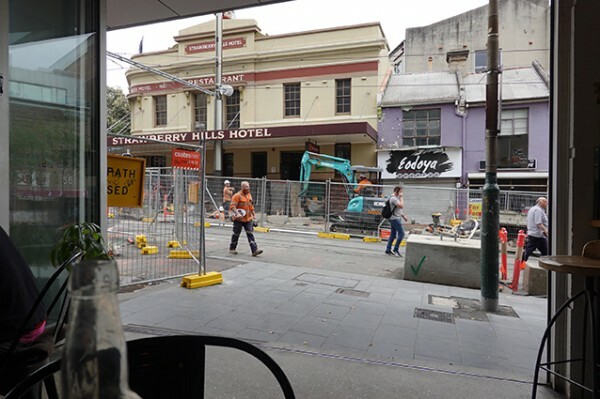 At the time we were flatmates in Sydney both studying in Uni,” explains owner Steven Zhang, who is originally from China. 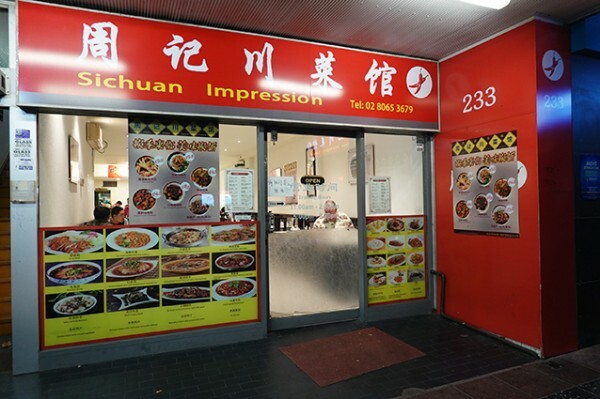 Zhang kicked off with a store in Kingsford that was mostly focused upon delivery, before opening additional stores in Waterloo and Wentworth Point. 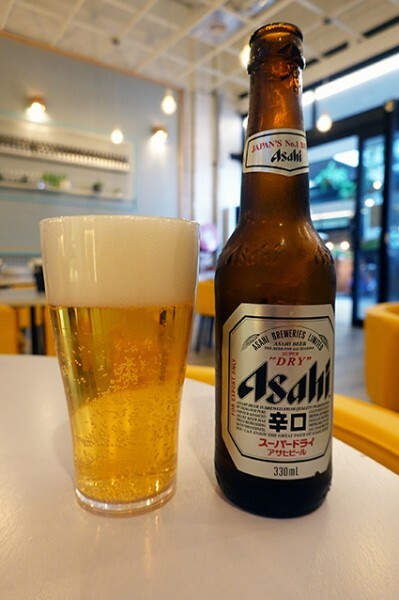 We get our lunch started with a spicy bowl of nicely presented Kim Chi ($3.90) and an Asahi Beer ($8.90). 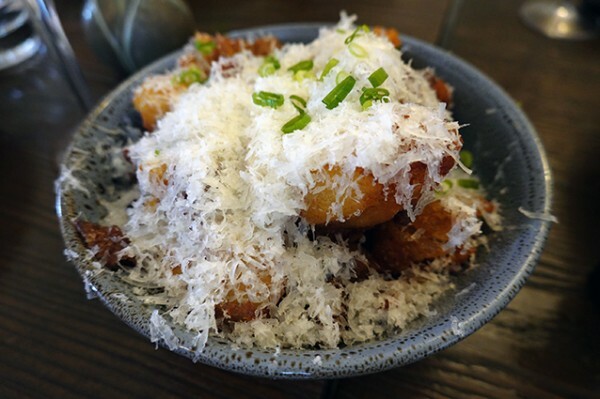 From the rice bowl section of the menu, the Chicken Katsu Curry Rice Bowl ($13.90) jumps out. White rice is topped with a comforting but slightly too thick turmeric and cumin-based yellow curry, and crumbed fingers of good quality chicken. Lightly blanched broccoli florets and sweet potato chips add some crunch, while pink pickled cabbage injects some tang into this homey and honest everyday eat. 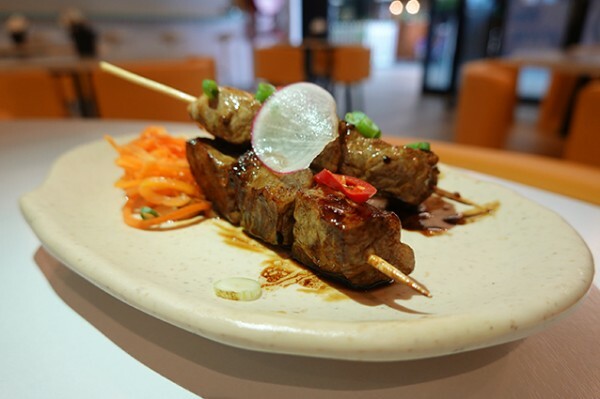 The serving size is moderate, so you can add on a Wagyu Beef Skewer ($5.90/2) without worrying about food waste. The beef is good quality, and cooked so it is juicy inside, though I reckon wagyu benefits from a blowtorch blast to finish it off with lovely caramelisation. 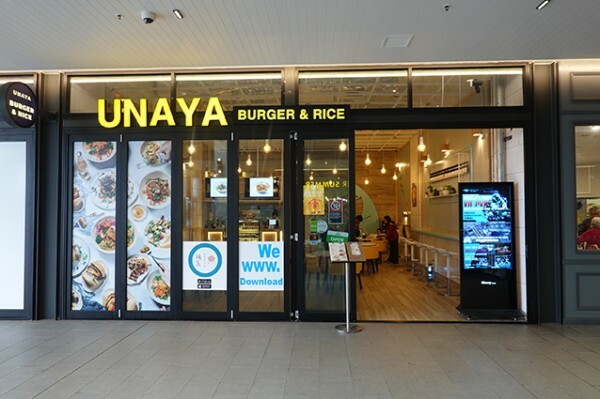 From the burger side of the menu, I hit up the Unaya Signature Rice Burger ($17.90) – the only burger presented without a regular burger bun. 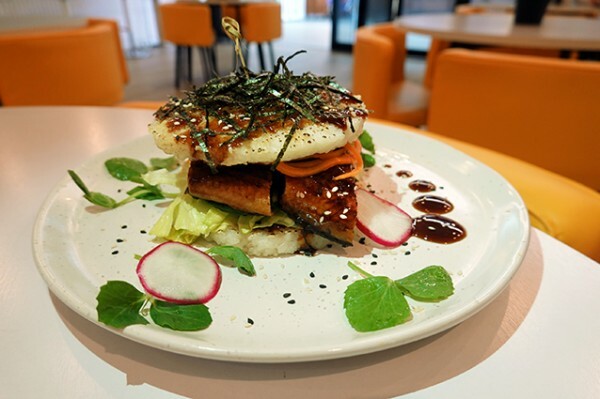 Instead you get two chewy, nori-topped rice cakes sandwiched around grilled Japanese eel, iceberg lettuce, cucumber, cream cheese and pickled carrot. 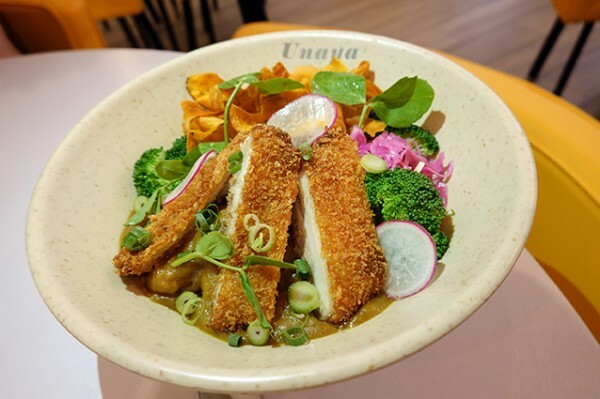 It’s definitely a knife and fork job, but I liked it anyway – along with the fact that, like everything else on the Unaya menu, it’s yours for fewer than twenty bucks. 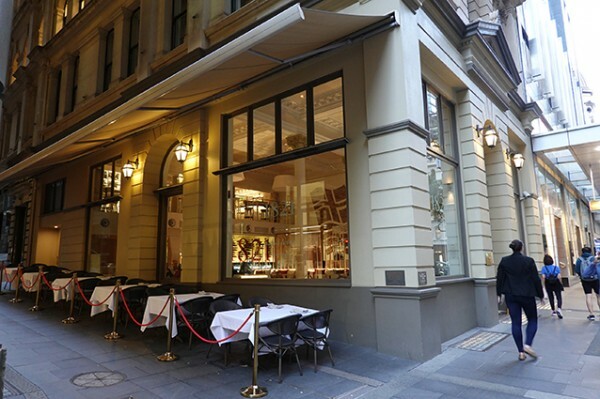 So Frenchy So Chic was the first place I encountered Sacre Bleu Sydney. 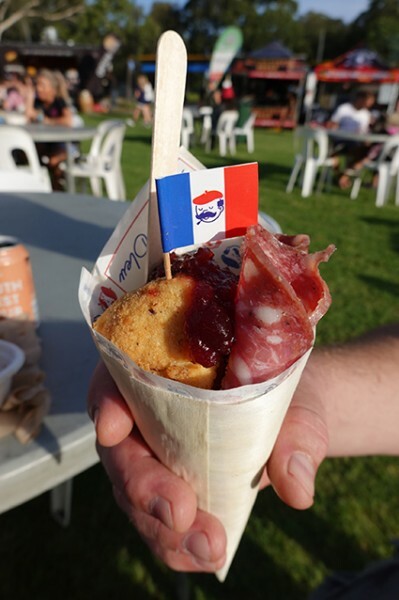 I’m always excited by well-constructed festival food – something you can walk around and eat without making a mess – and their flag-flying paper cones caught my eye. 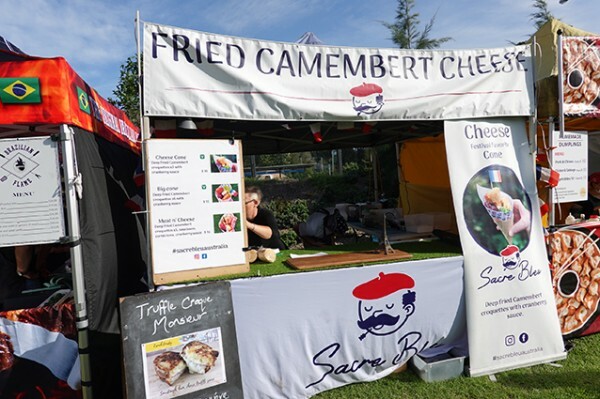 However it was at Aussie NightMarkets in Mona Vale that I actually got one of their cones into my own hand, after being lured in by a big sign advertising fried Camembert cheese. Meat’n’Cheese ($16) teams five golden, fried, gooey-cheese nuggets with dollops of cranberry sauce and firm, chewy slices of saucisson. 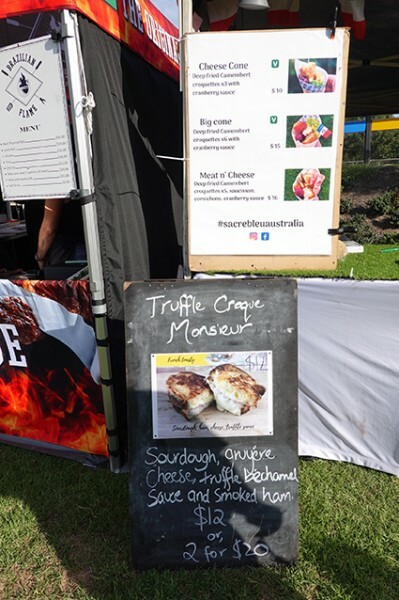 This cone was supposed to contain cornichons, but I didn’t find any – a shame because their tangy crunch would have been just the ticket against the richness of oozing Camembert cheese. With the cone being perfect walking around food, we were able to seek out a drink while we enjoyed our cheese. 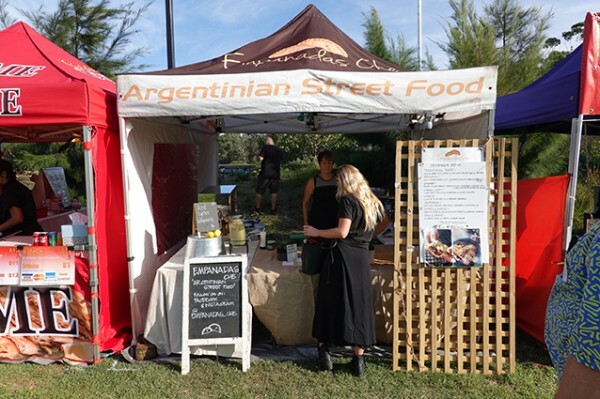 At Empanadas Che, an outfit doing Argentinian street food in the form of a variety of different empanadas, we were able to find something other than the soft drinks sold everywhere else. 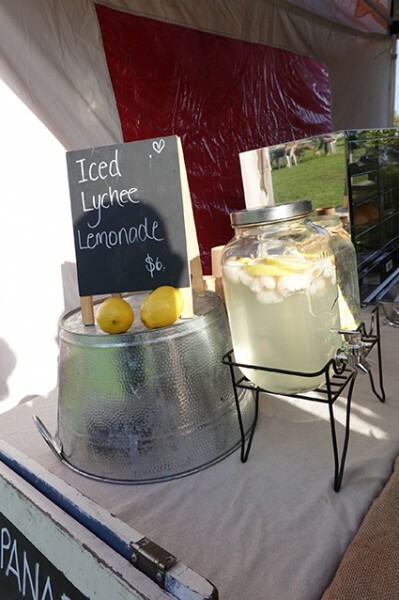 Their Iced Lychee Lemonade ($4) was surprisingly (and welcomely) tart. While we were walking around, the other thing that caught my eye was the young Aussie NightMarkets staff cleaning tables. 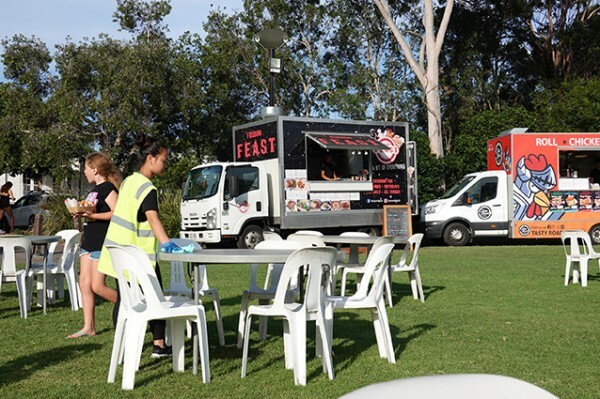 Yes, it’s a little thing but it makes a high volume night market much more pleasant to have constant renewal of the places people can sit down to eat if they're not smart enought to get a Sacre Bleu Sydney cone! 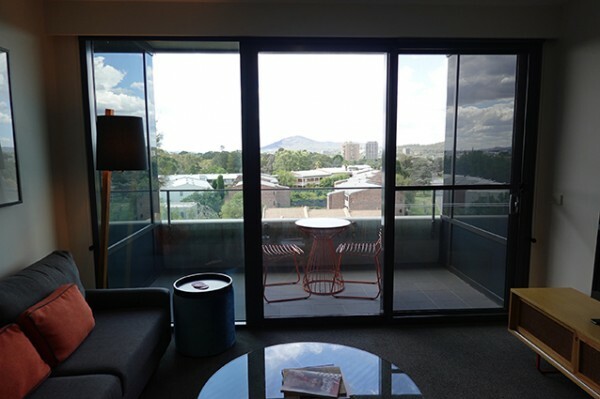 For my latest Canberra sojourn my digs were a luxe apartment inside the East Hotel. 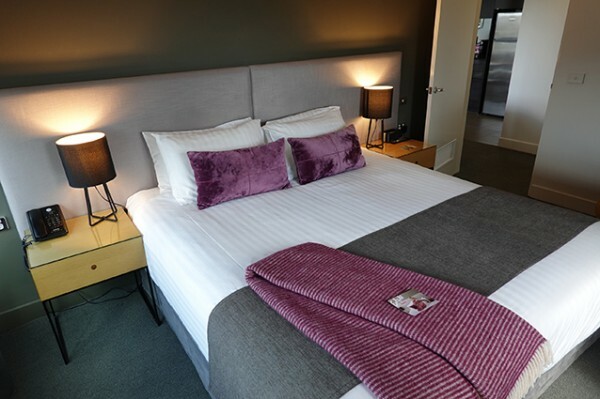 Sitting right on the border between Kingston and Manuka, this purpose-built medium sized hotel popped up in 2012. 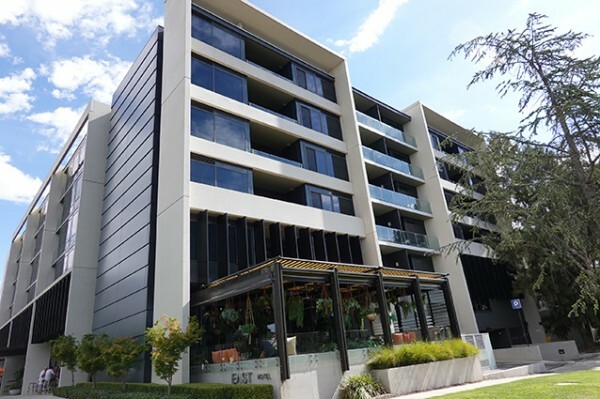 If, like me, you’re an architecture buff who hates ugly buildings, I reckon you’re going to like East Hotel's simple glass and concrete form that blends in nicely with the surrounding medium density housing. 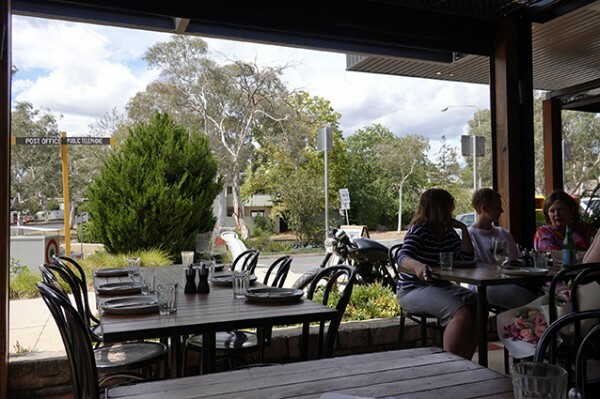 In terms of location, most of Canberra appears to be a fifteen-minute drive from any other part of Canberra, which is pretty much an affordable, under twenty buck cab or Uber ride. 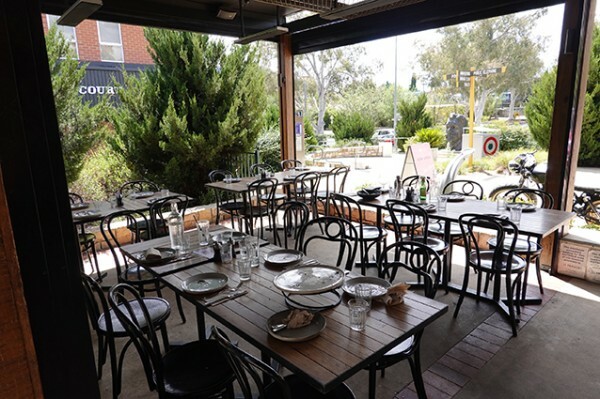 Kingston is famed for its foreshore, with restaurants, cafes and attractions like Canberra Glassworks, and the Old Bus Depot Markets that runs every Sunday. 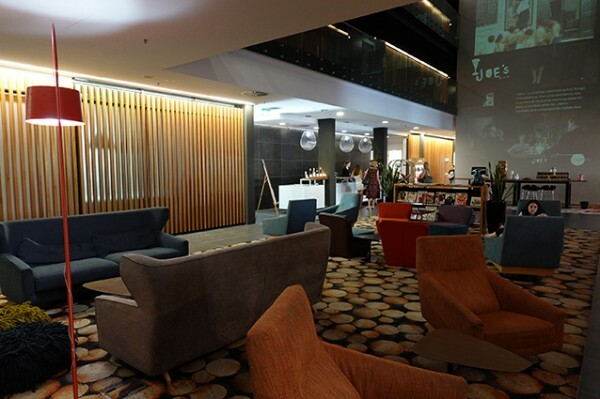 The hub of the East Hotel is an attractively designed lobby, with bright, contemporary colours, and multi-floor projections. 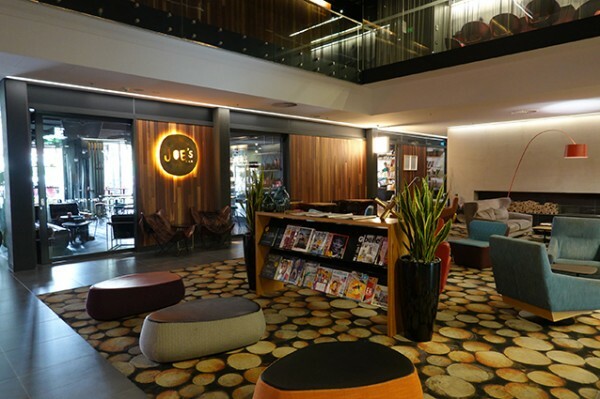 There’s a range of reading materials and seating options to enjoy them in; a pair of Macs for guest use; and cute little touches, like glass jars of lollies that sensibly get taken away at dinner time. 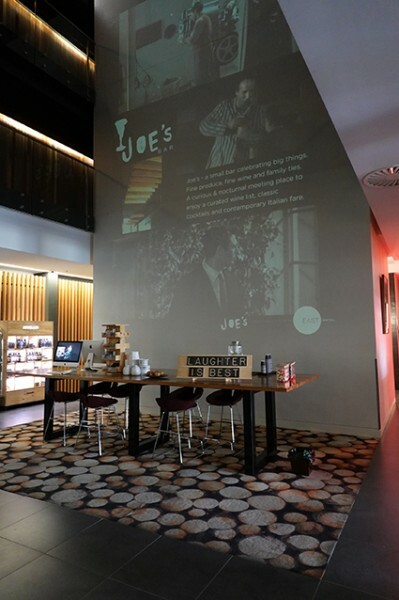 With underground parking, an all-day diner and bookshop called Muse: Food, Wine & Books, a bar called Joe’s Bar, and an Italian restaurant, Agostinis doing everything from pizza to steak to an elaborate chef’s table experience, you can end your Canberra road trip as soon as you park your car. 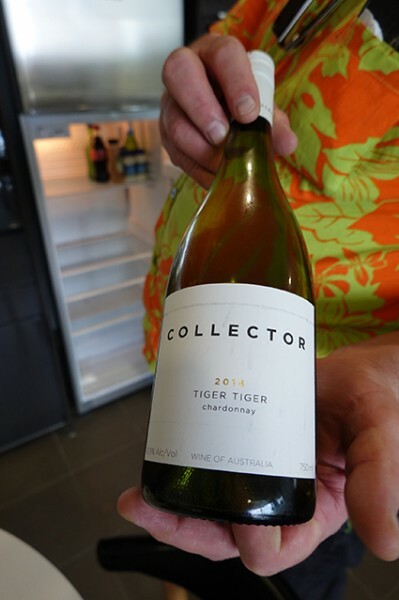 There’s even a pub and bottle-shop across the road, if you don’t feel like drinking the carefully selected Collector wines, you’ll find upstairs in your 4½-star serviced apartment. 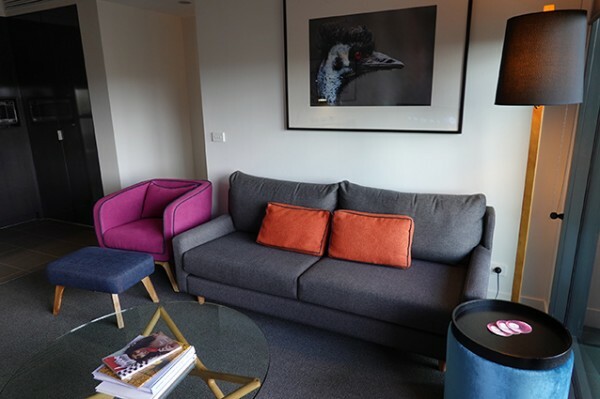 Walking in through the door of our fifth-floor luxe apartment (from $249/night) you can immediately see the East Hotel is attempting to shake off the boring label that has dogged Canberra for as long as I can remember. Wire-framed orange outdoor chairs are as eye-catching as the expansive view. Inside there are matching orange cushions, a magenta statement chair, and a blue velour side table. 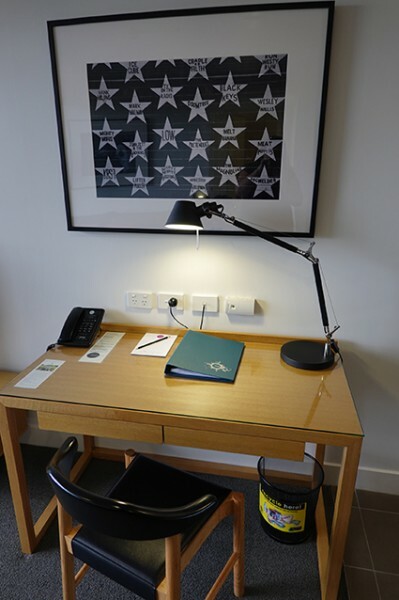 Even the art is contemporary, with the desk nook topped by a band-inspired piece that features everyone from the Meat Puppets to Joan Jett. 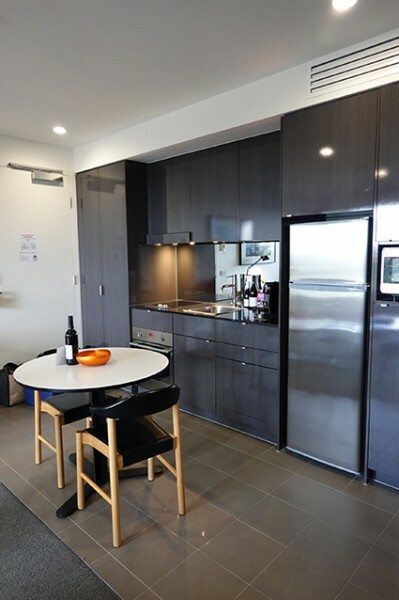 The apartment is spacious, with a compact kitchen that has everything you’ll need to cook your own dinner and eat it at a small dining table. 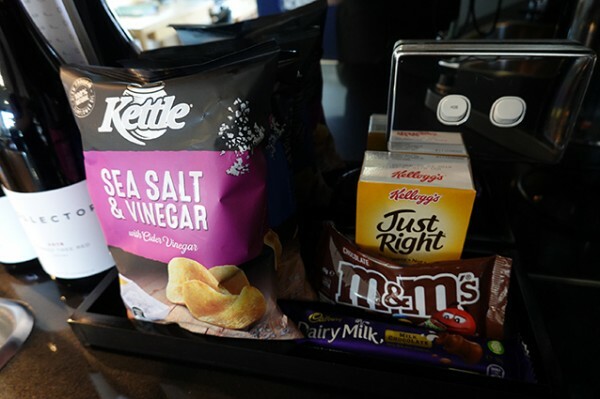 Opening the cupboards, you’ll even find a discretely stashed washing machine and dryer. 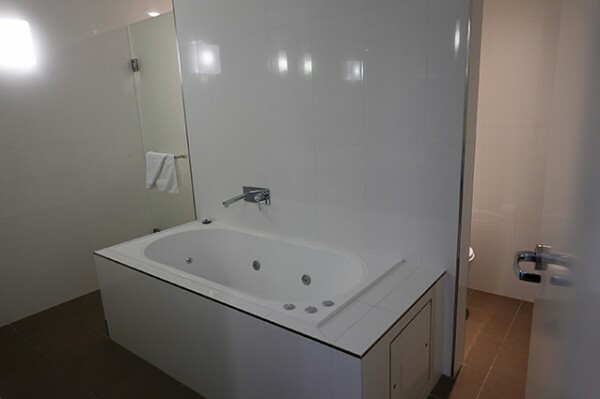 The bathroom has a bath, plus separated shower and toilet, all kitted out with Appelles Apothecary & Lab products that you can buy full-size in the lobby if you happen to fall in love. 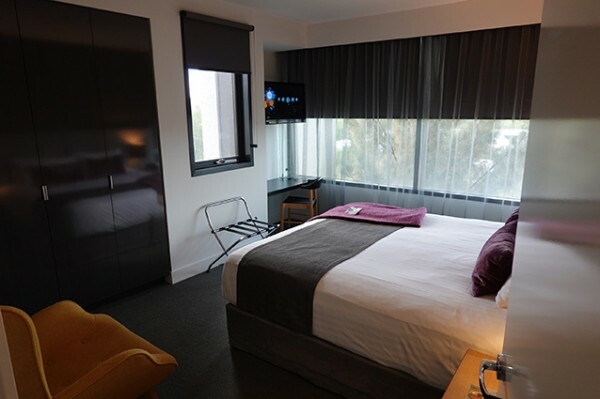 The bedroom is cosy, lending itself both to summer (with air conditioning) and winter, with a colourful fluffy throw and a 32-inch LED television you can watch in bed. The king-sized bed has lovely crisp linen and a super-soft bed topper that, when combined with airy pillows, saw me sink in for an excellent sleep. 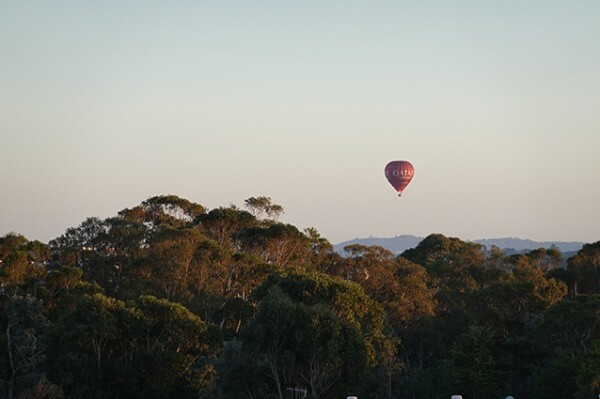 Waking up to a delicately painted mauve and orange-hued dawn sky with a hot air balloon floating by was priceless. 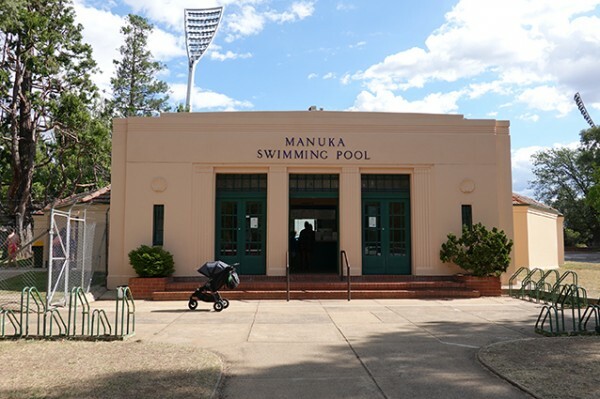 And finally, while there isn’t a hotel pool onsite, a quick flash of your room key will give you free access to Manuka Swimming Pool, a five-minute walk from the East Hotel. 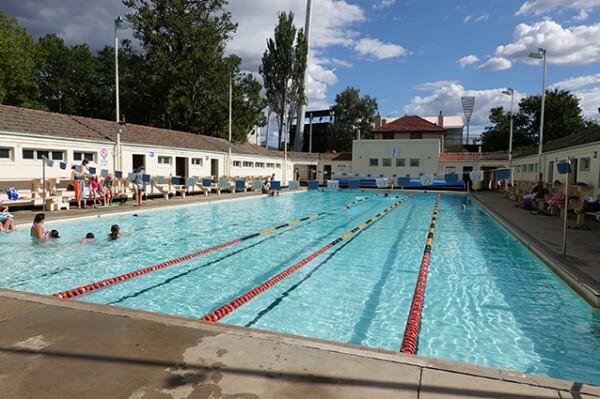 Opened back in 1931, Canberra’s first public pool is an Art Deco delight with a ‘last output of Empire’ vibe. 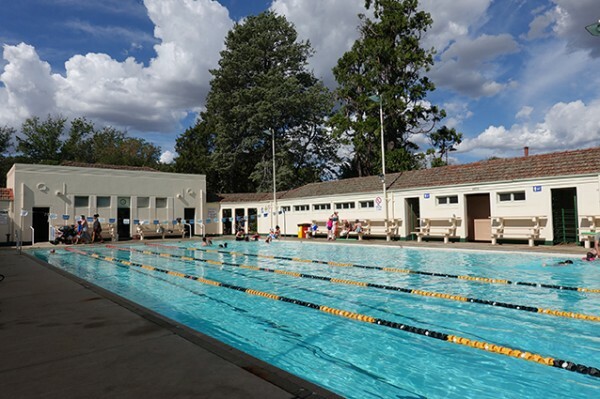 It’s deep too, down at the deep end, nine feet in the Imperial measure, so diving (and even bombing) is allowed. It was a nice place to hang out in the sunshine, without having to get back into our car before the three hour drive back home to Sydney.